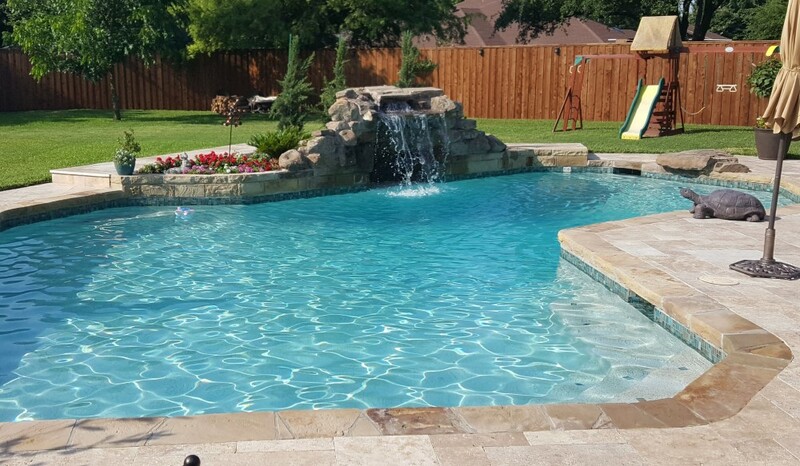 How Does Your Pool & Backyard Look? 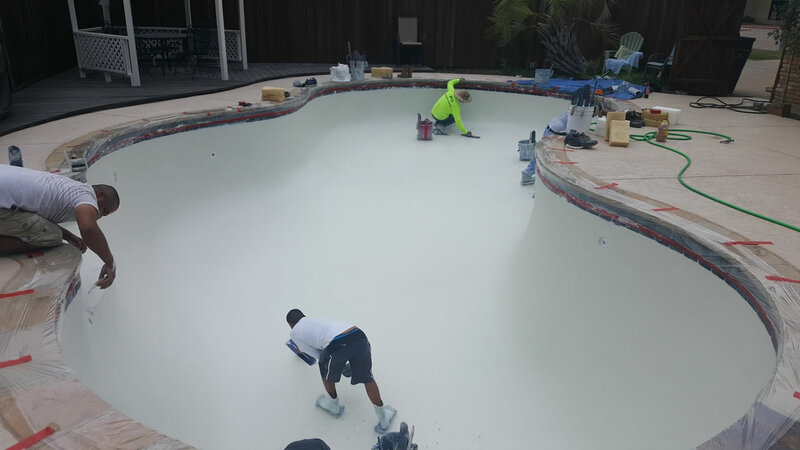 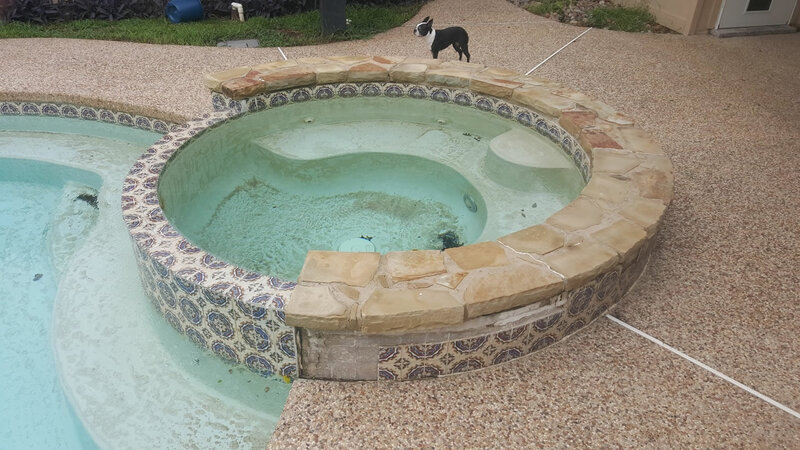 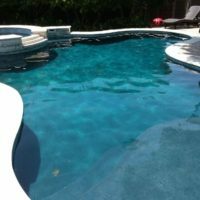 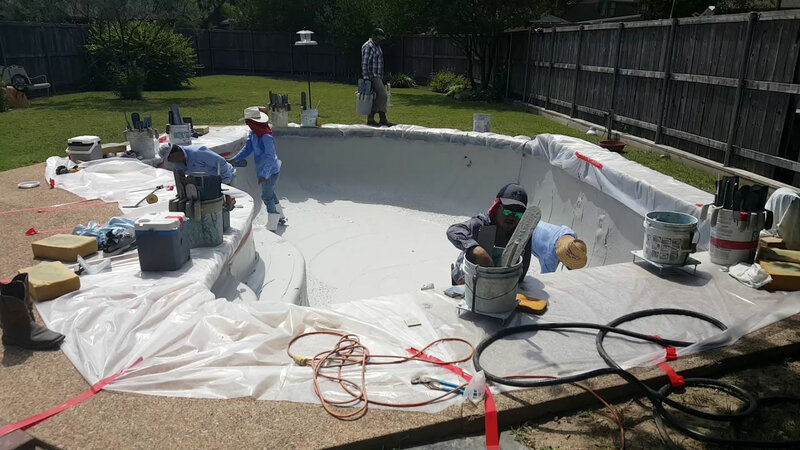 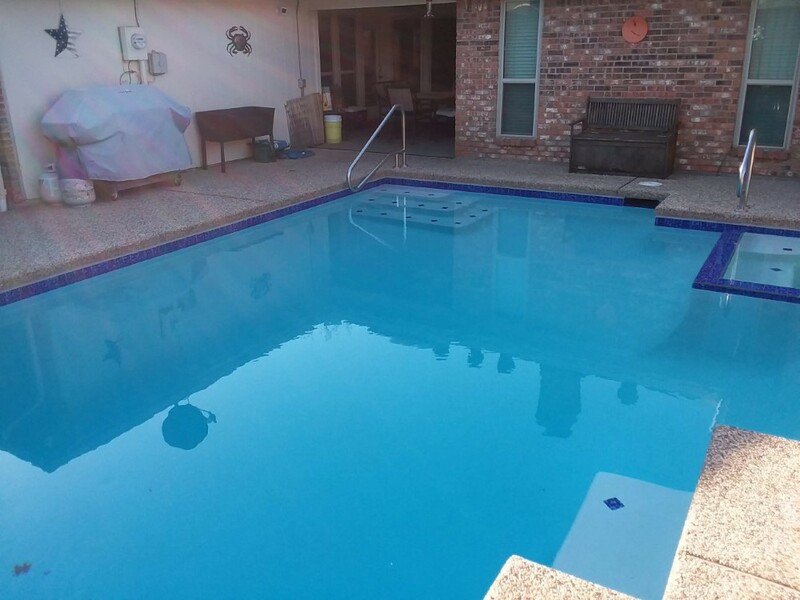 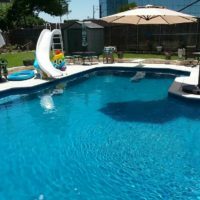 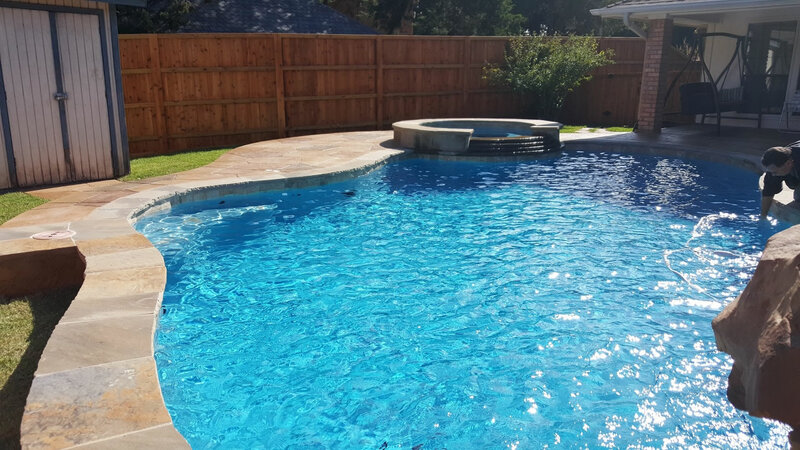 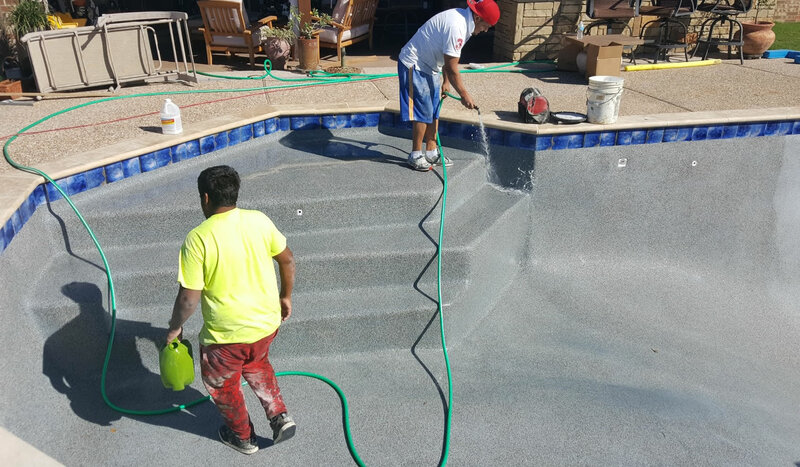 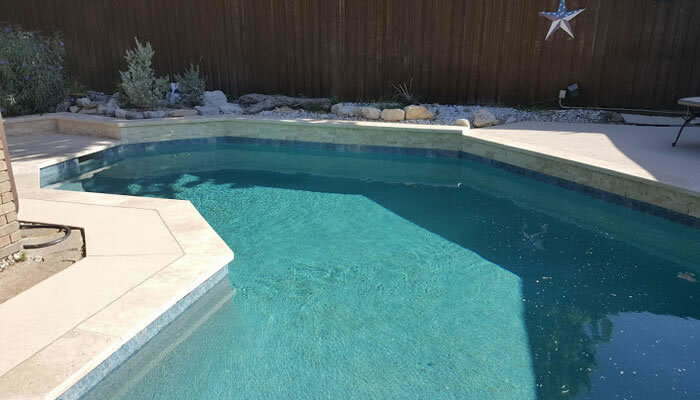 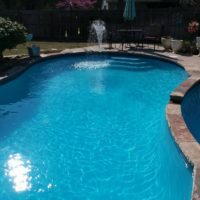 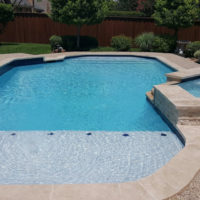 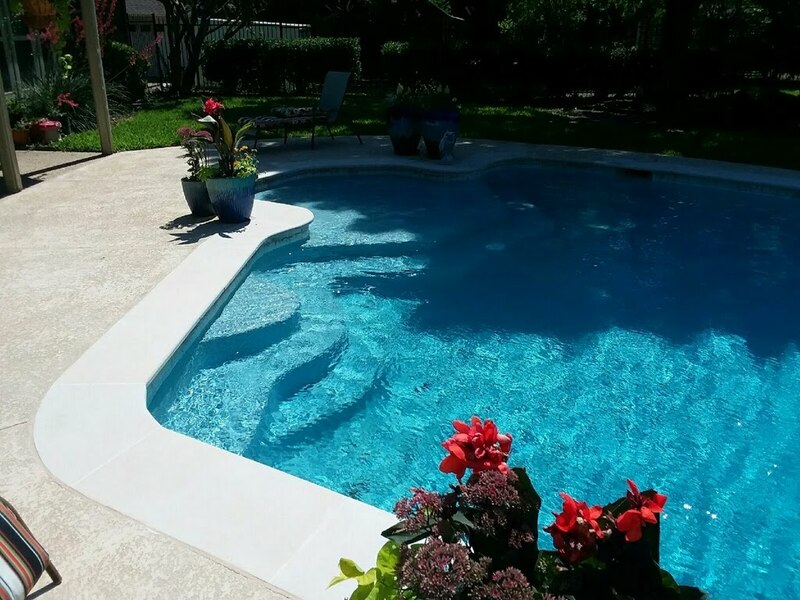 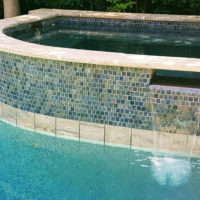 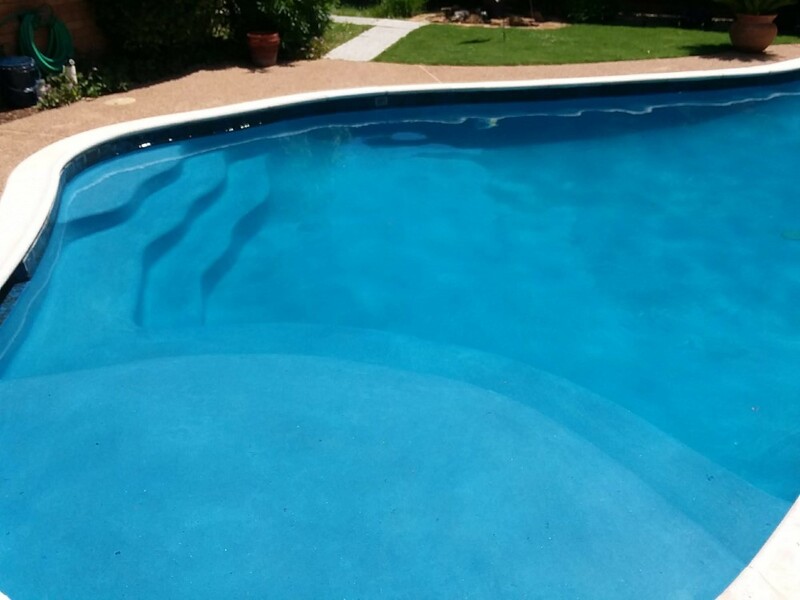 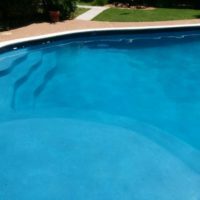 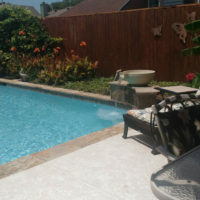 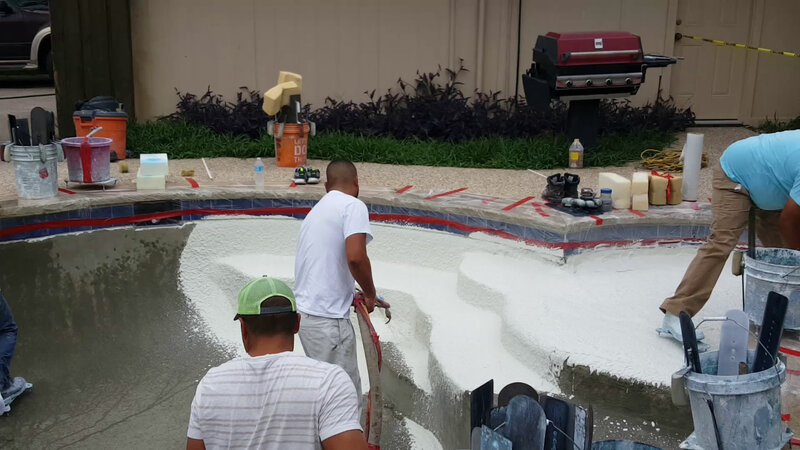 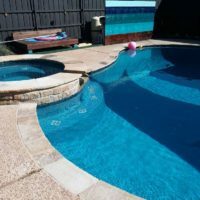 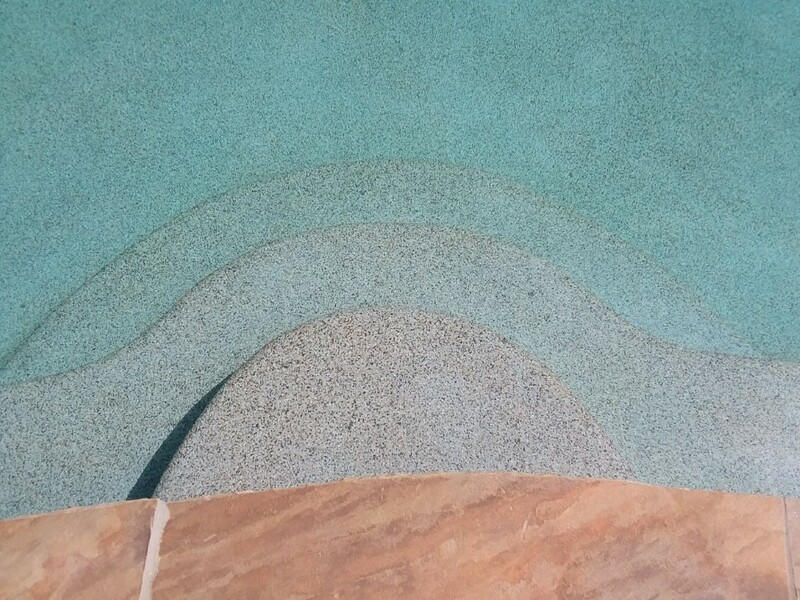 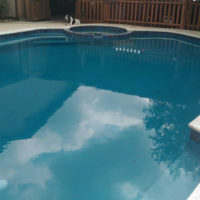 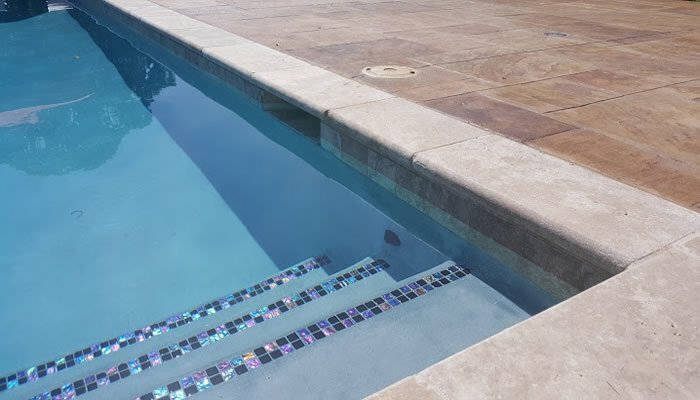 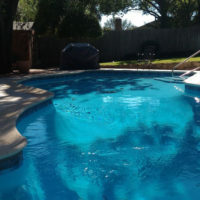 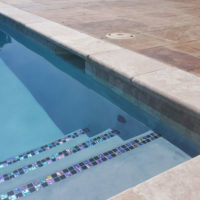 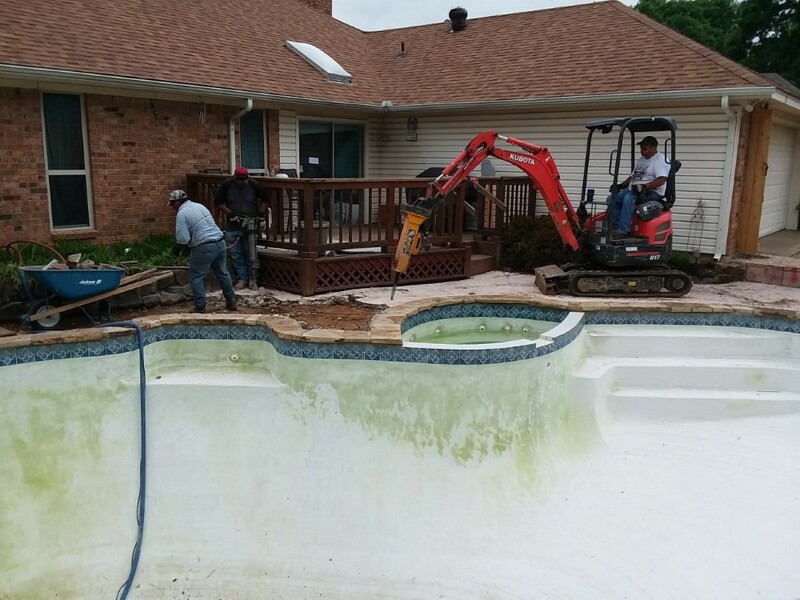 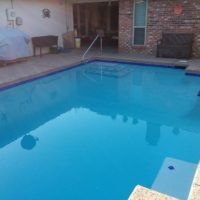 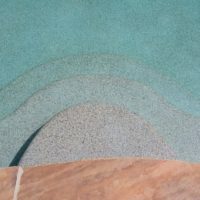 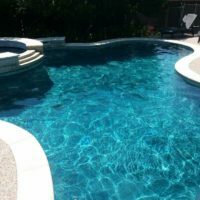 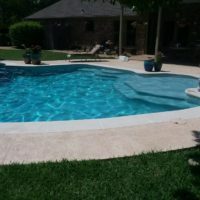 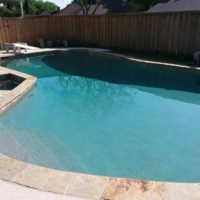 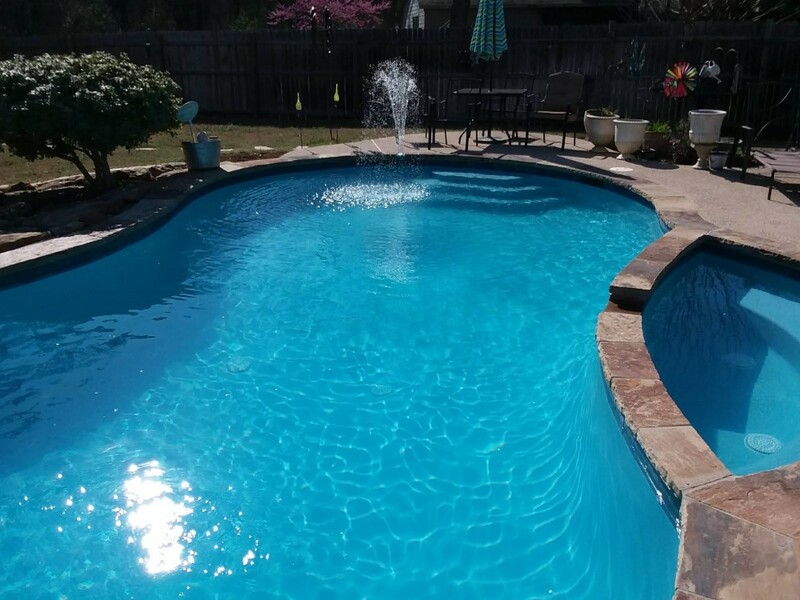 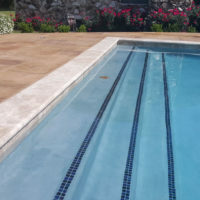 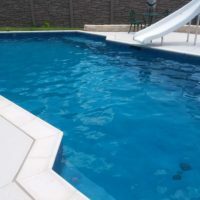 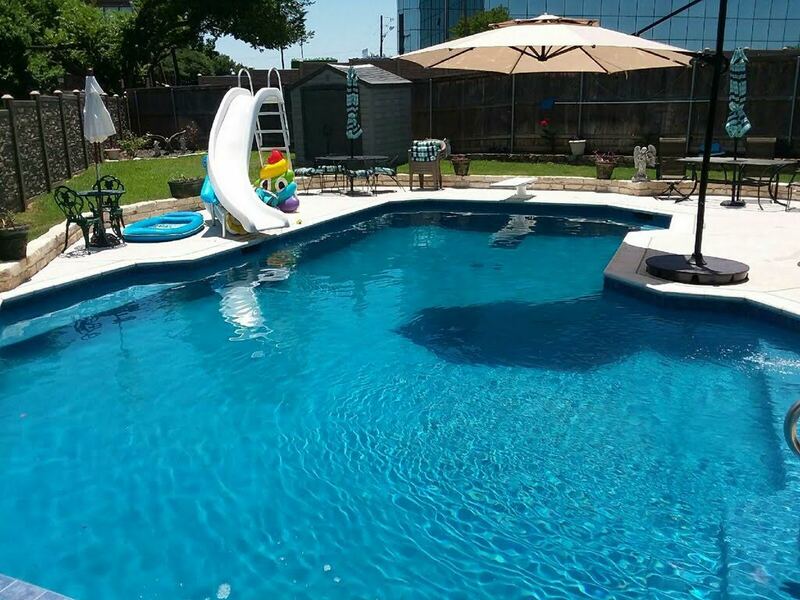 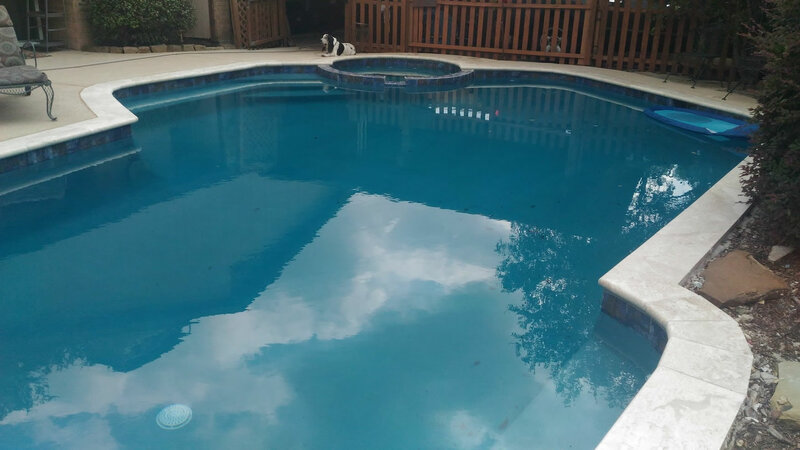 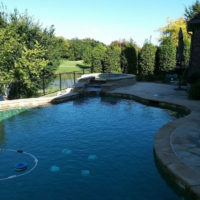 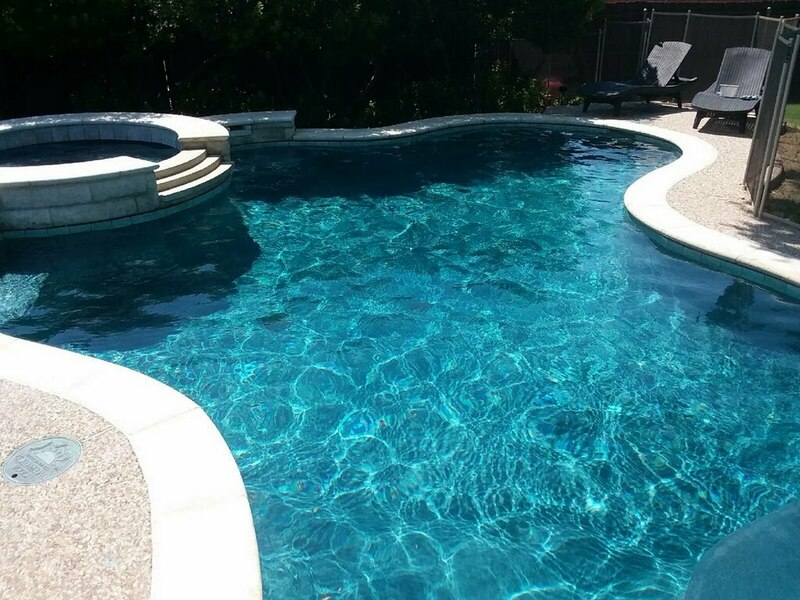 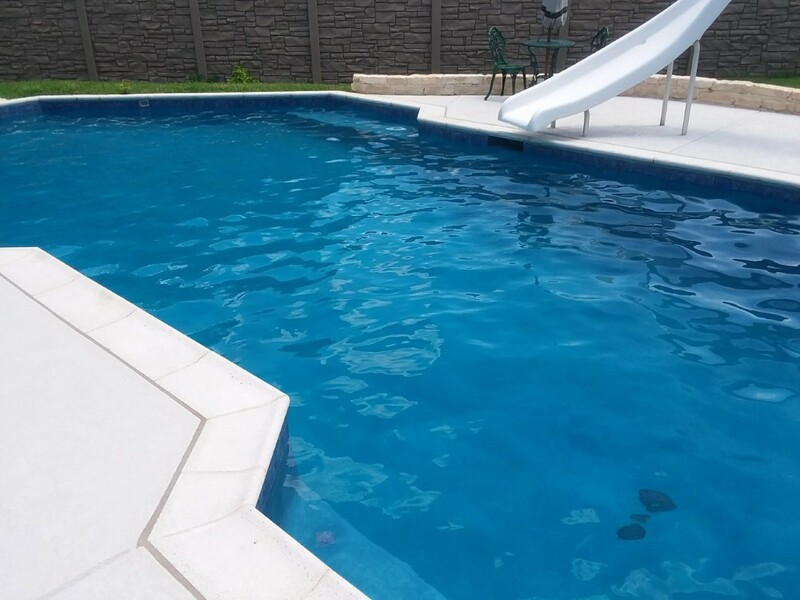 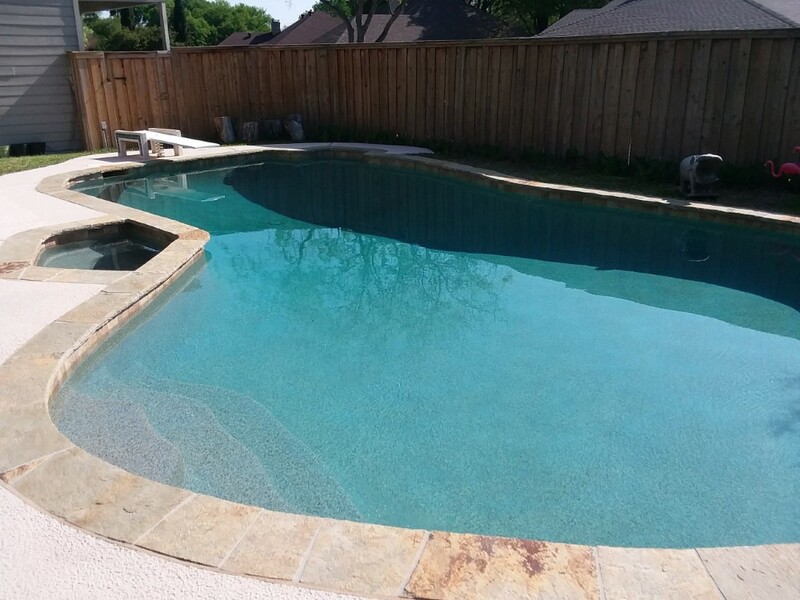 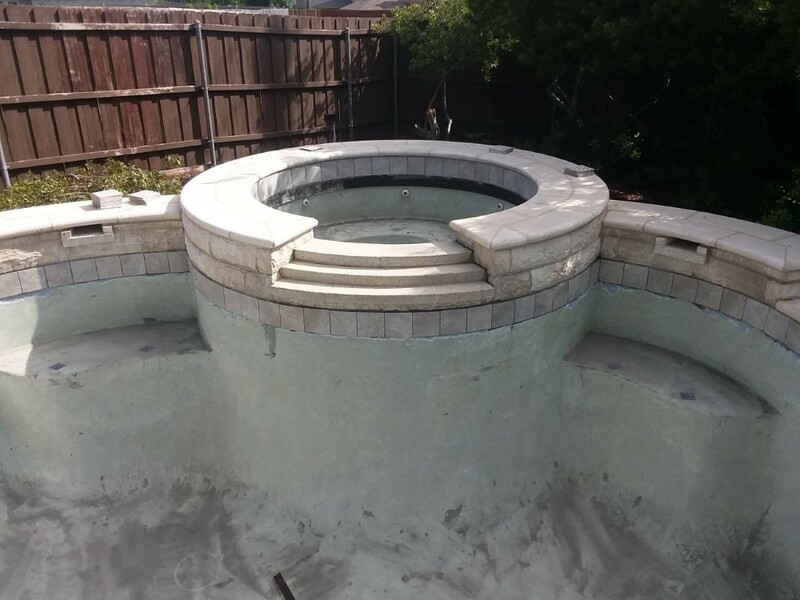 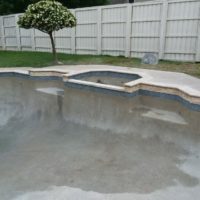 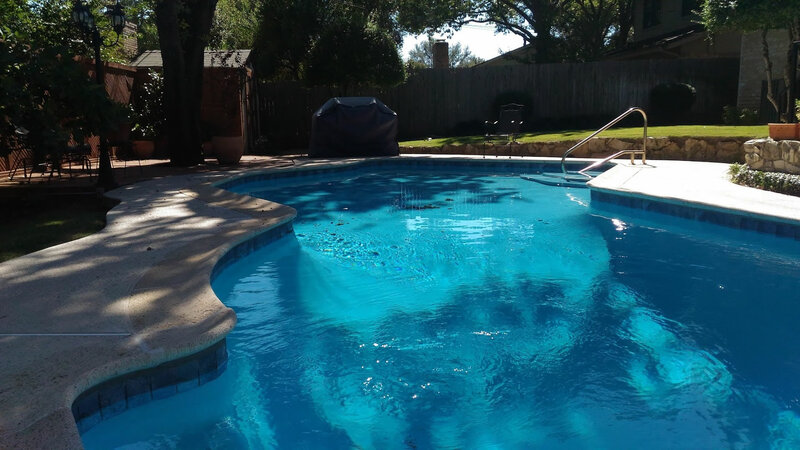 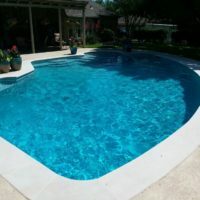 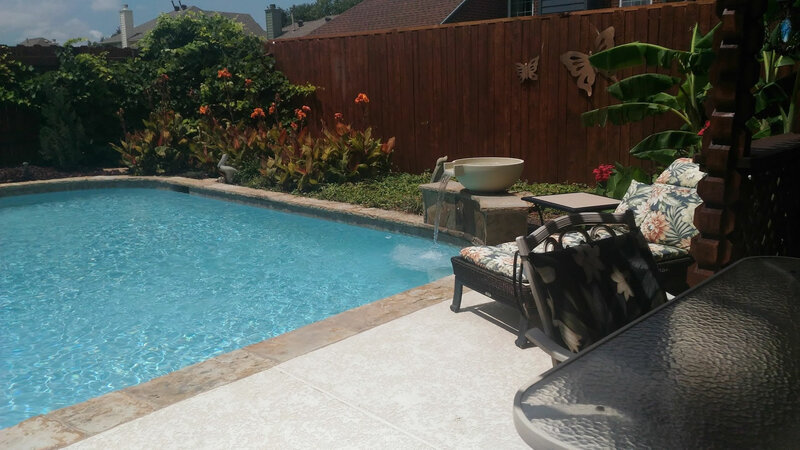 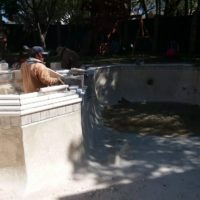 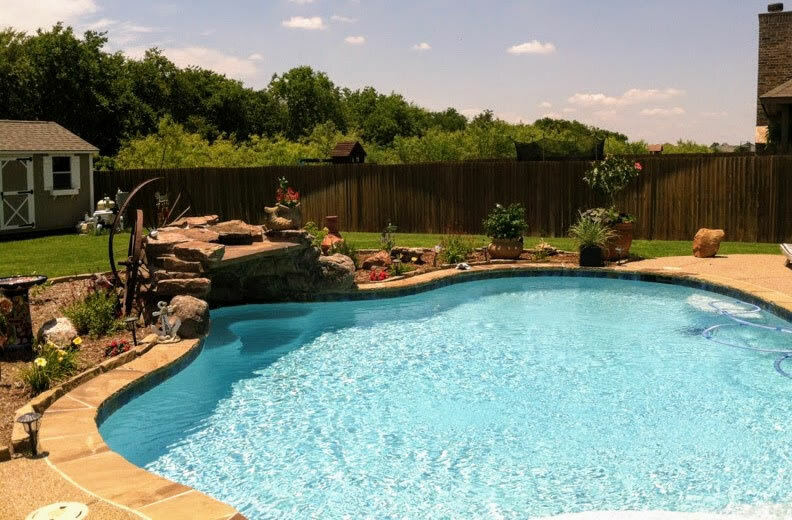 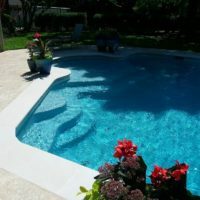 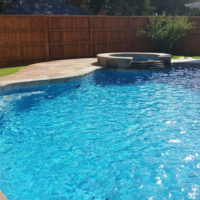 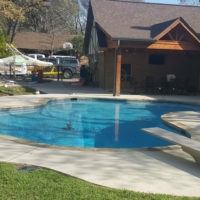 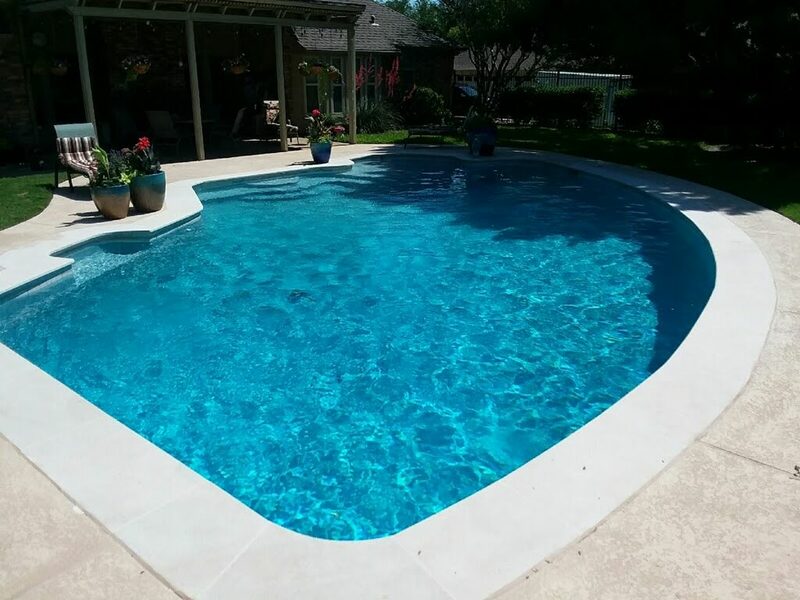 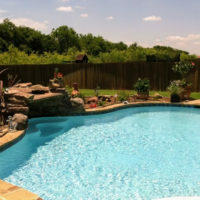 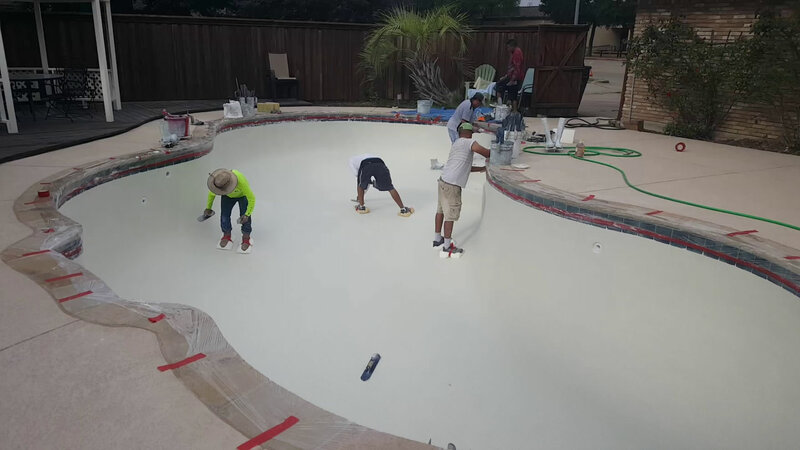 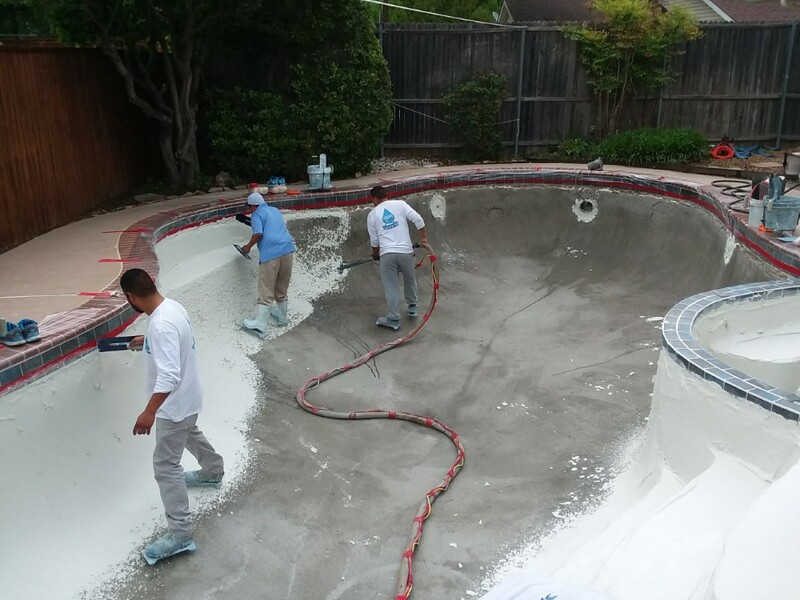 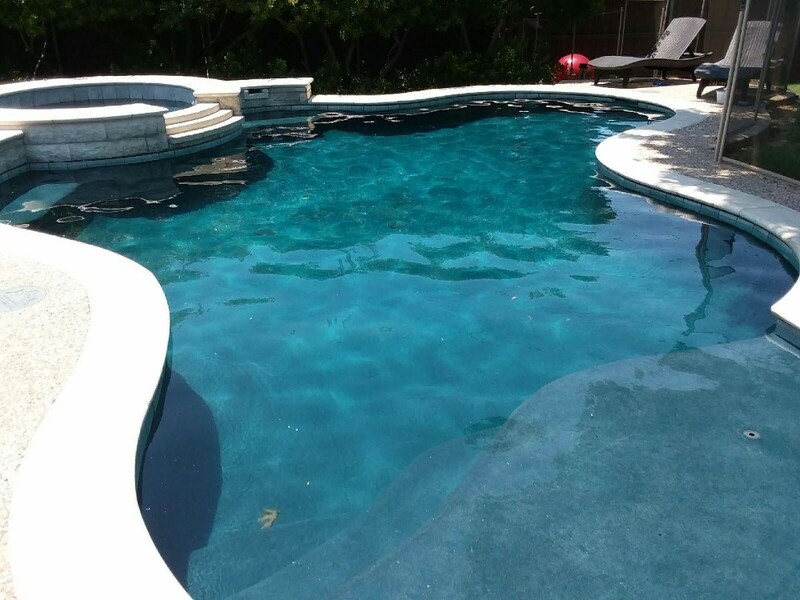 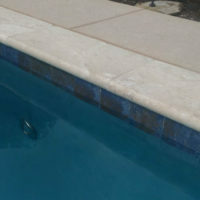 If you are like many of our customers, your pool is 10–35 years old and in desperate need of some TLC. 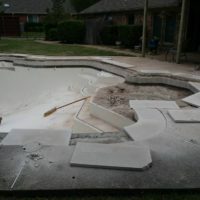 Maybe it’s time for some updates to make your pool area look beautiful again. The process is fairly simple. 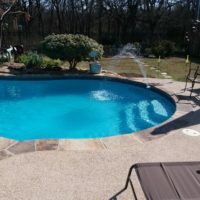 It’s EASY to get your pool looking BEAUTIFUL again. 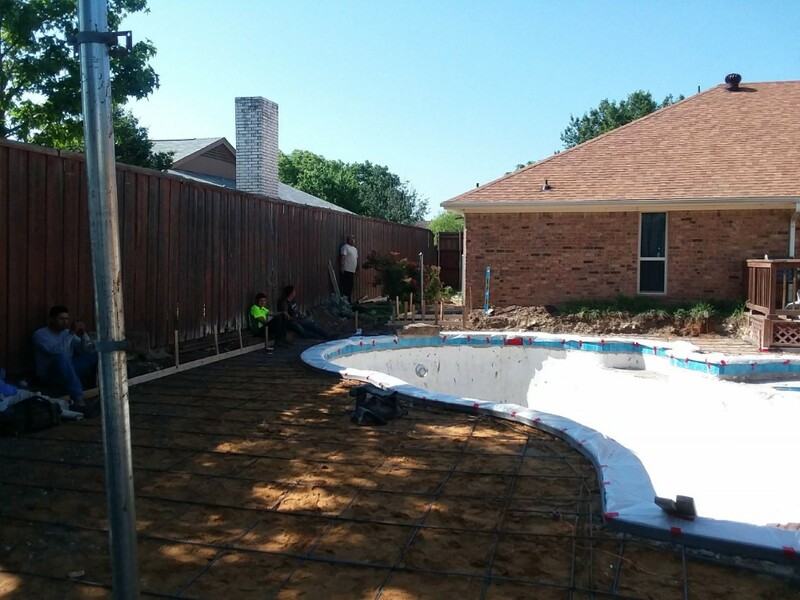 Call us on 214-453-3400 or 817-380-3544. 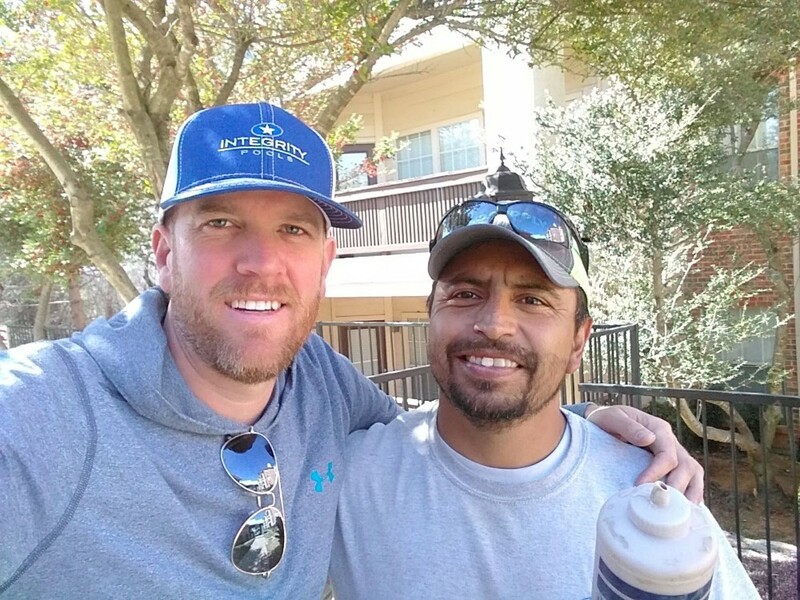 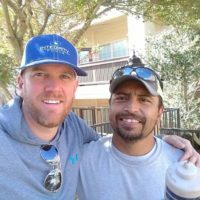 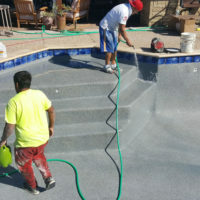 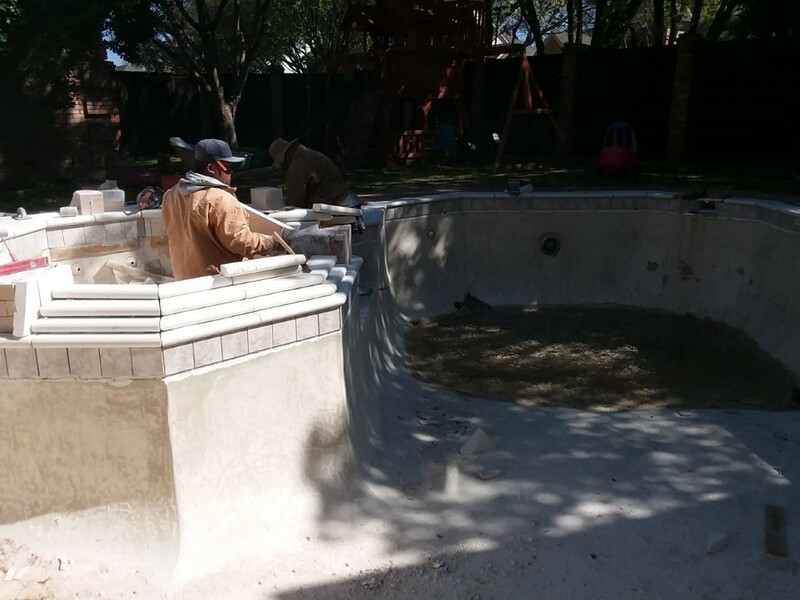 One of our friendly remodel team members below will meet you at your pool to show you options and choices. 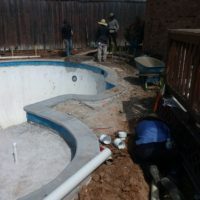 Once you give us the go ahead, we can typically start work within two weeks or so. 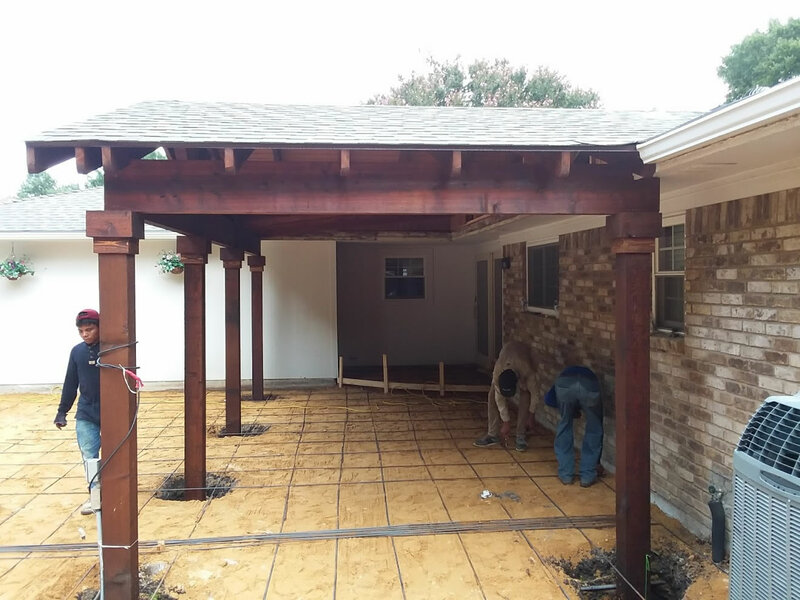 Most projects take anywhere from a few days to a few weeks depending upon what is involved. 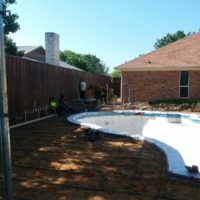 We focus on getting it done as quickly as possible. 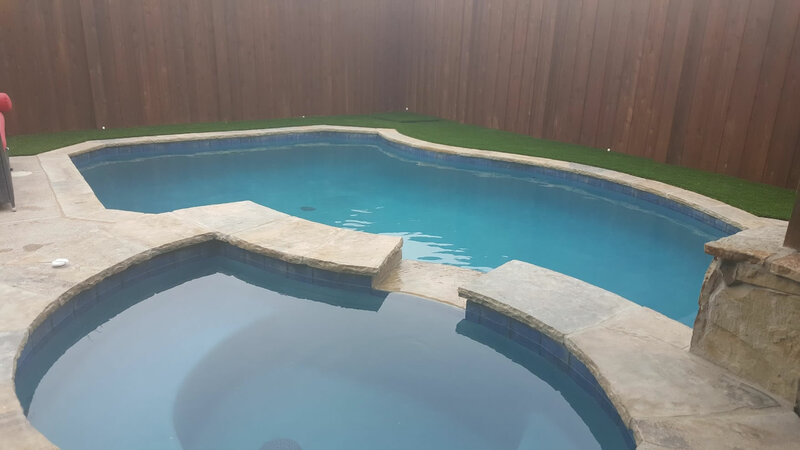 You get to enjoy your “New Look”’ pool and backyard in time for Summer. 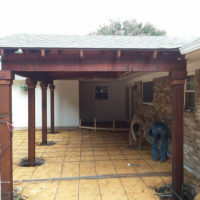 Below is a small sampling of some of our work. 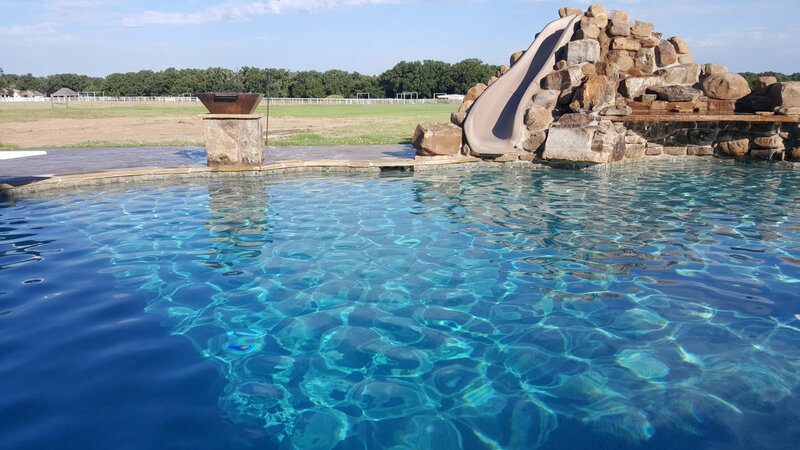 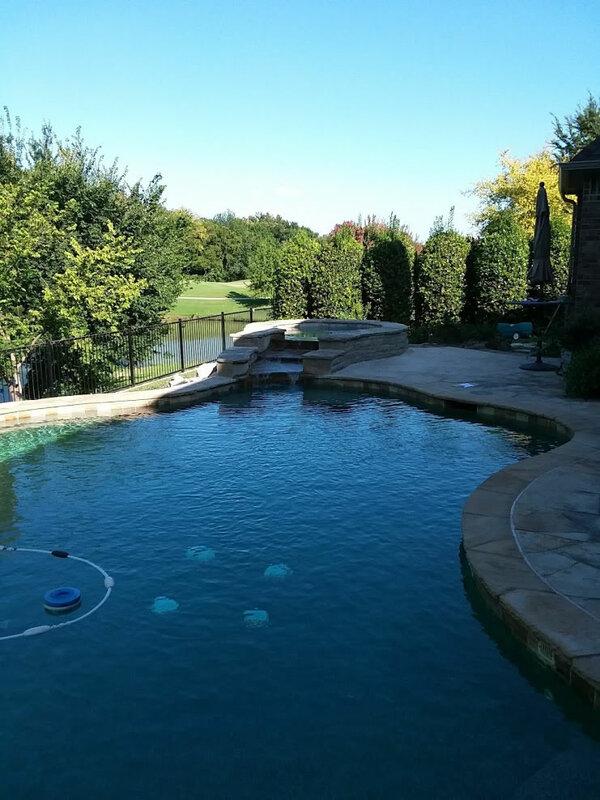 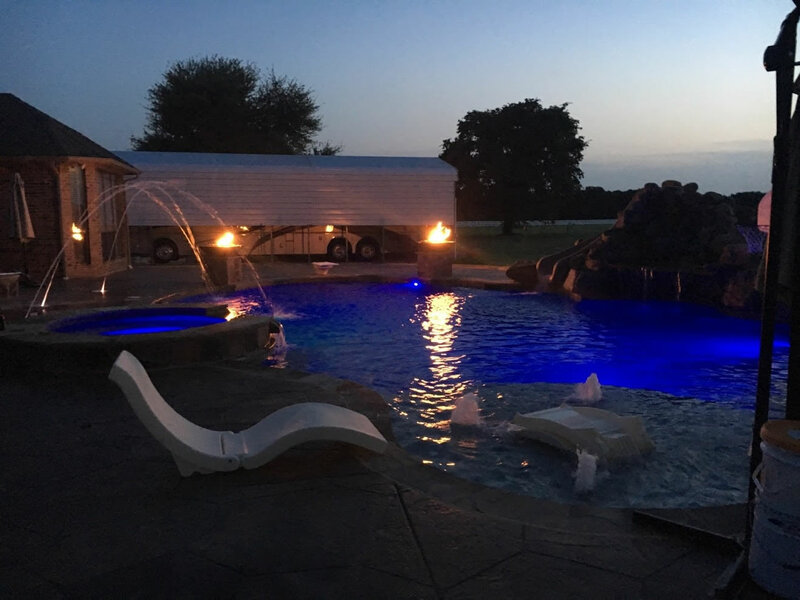 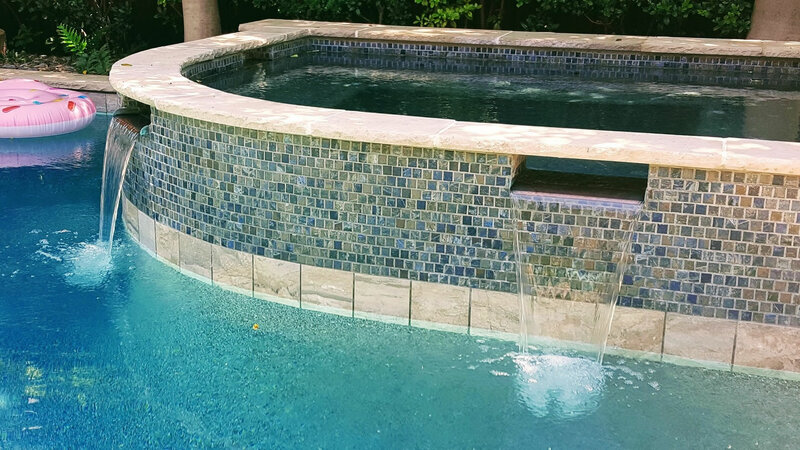 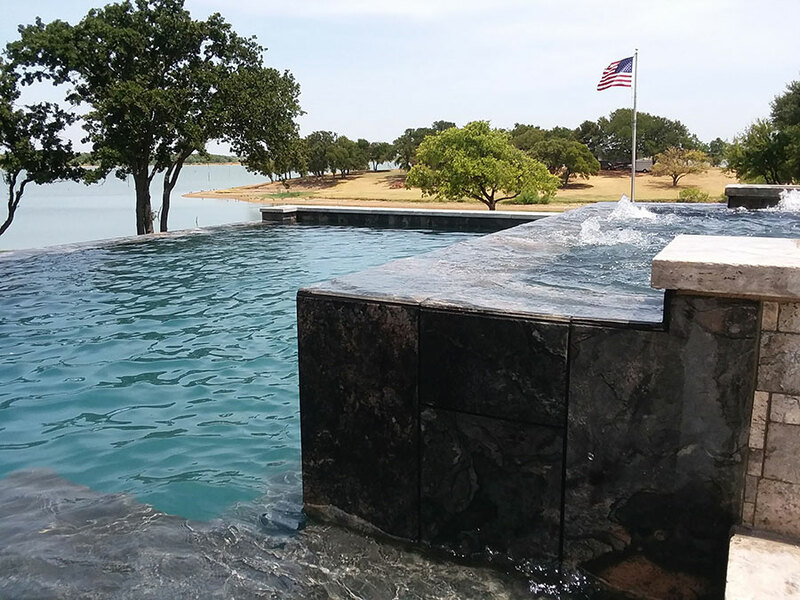 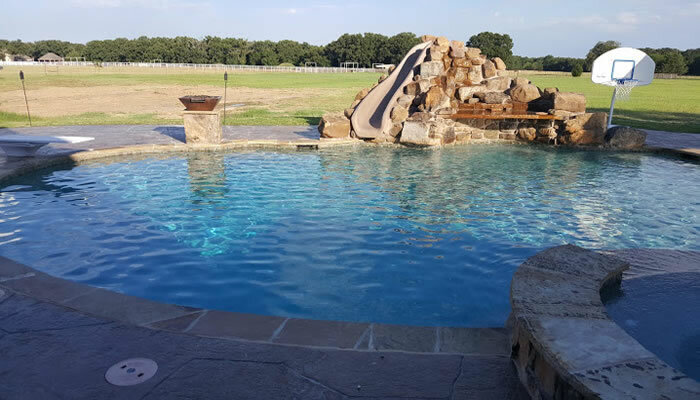 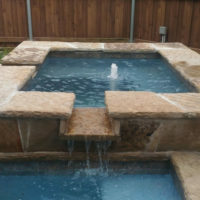 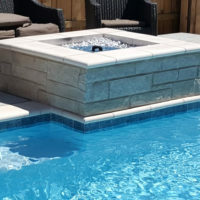 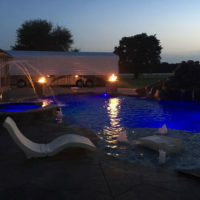 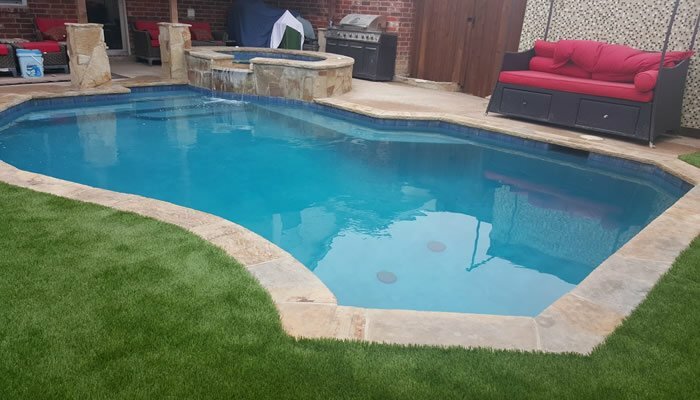 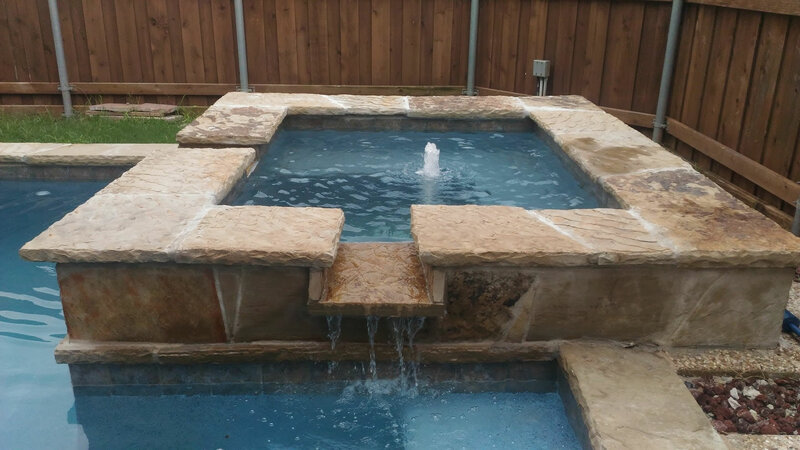 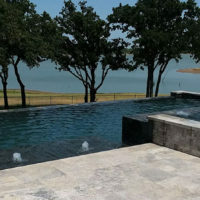 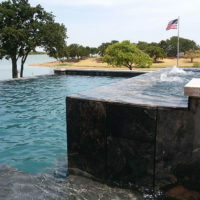 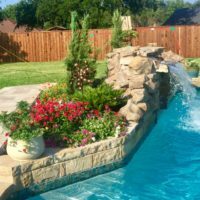 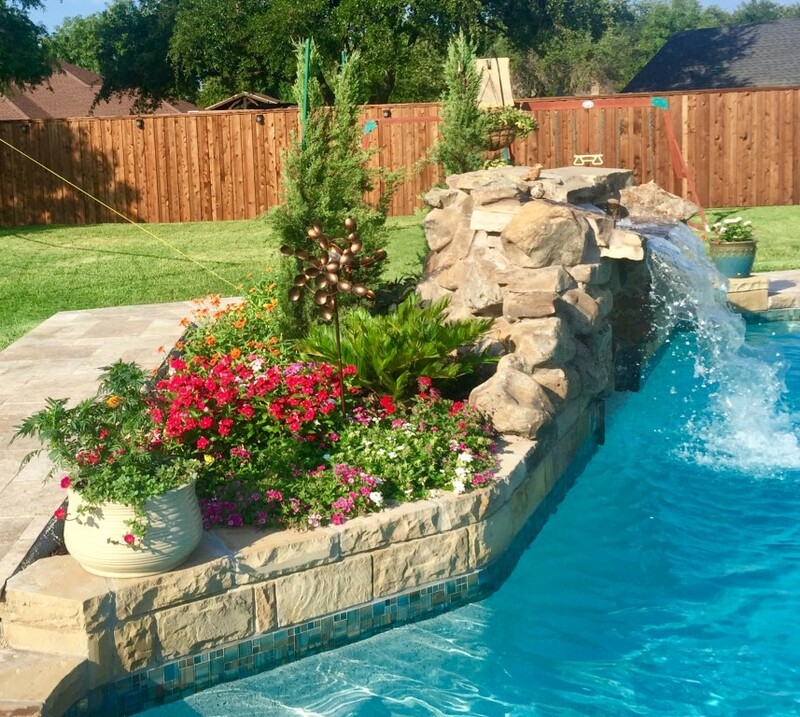 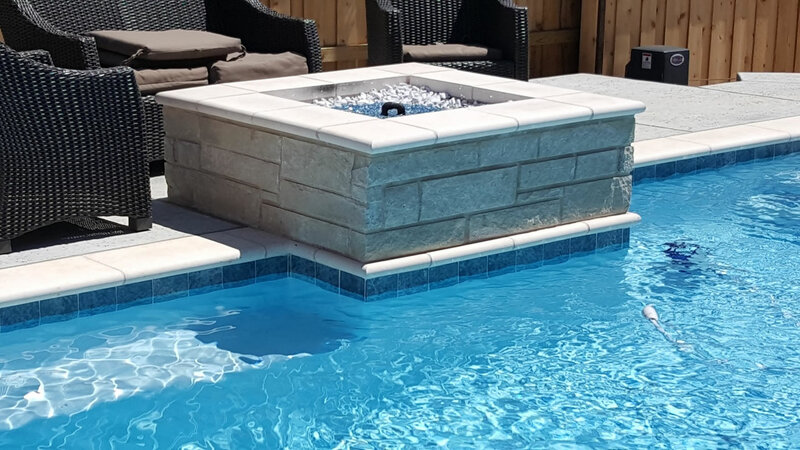 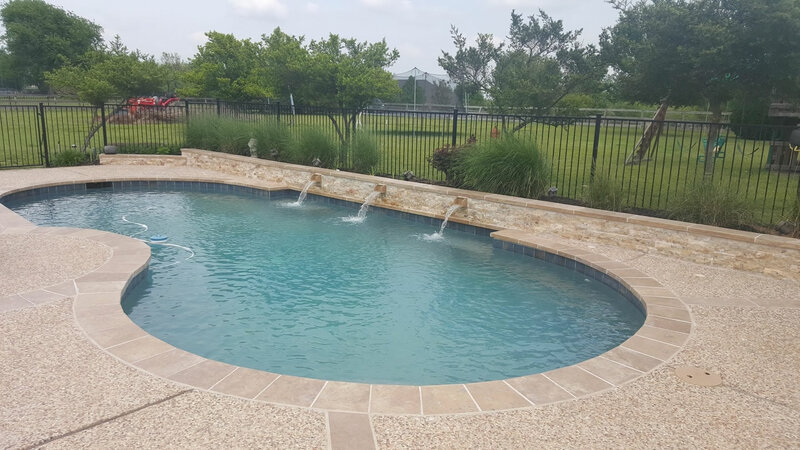 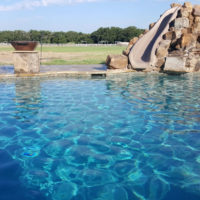 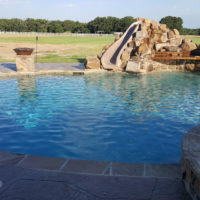 At this Terrell new construction we built a huge pool complete with large slide, water fall and grotto, pebble sheen plaster as well as swim up bar and oversize tanning ledge. 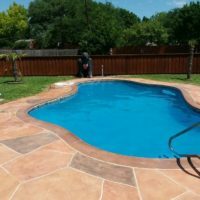 See more photos at our website. 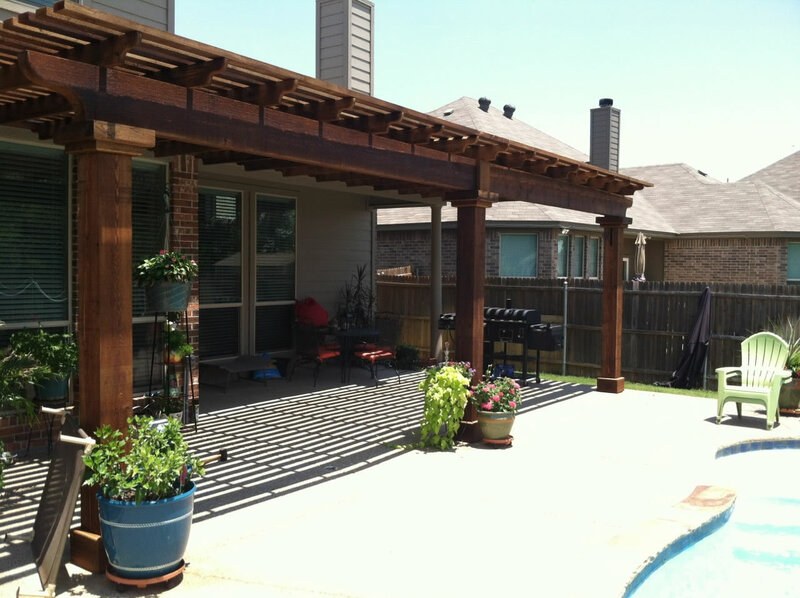 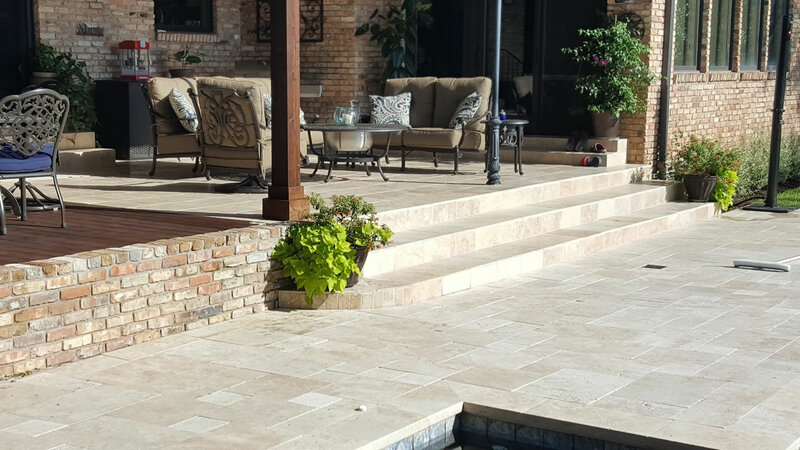 In this remodel project in Carrollton we cut back the old cantilever deck and installed travertine coping. 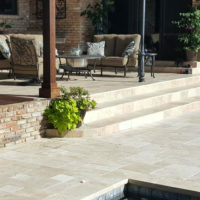 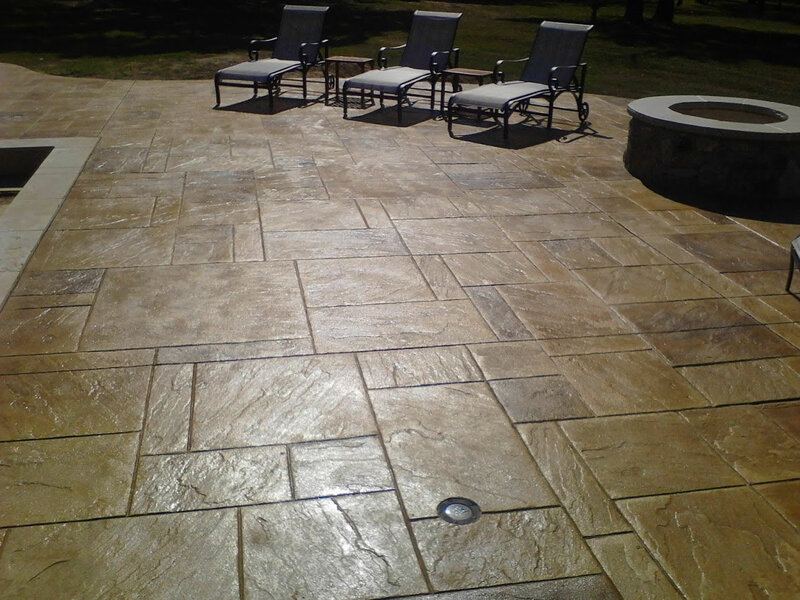 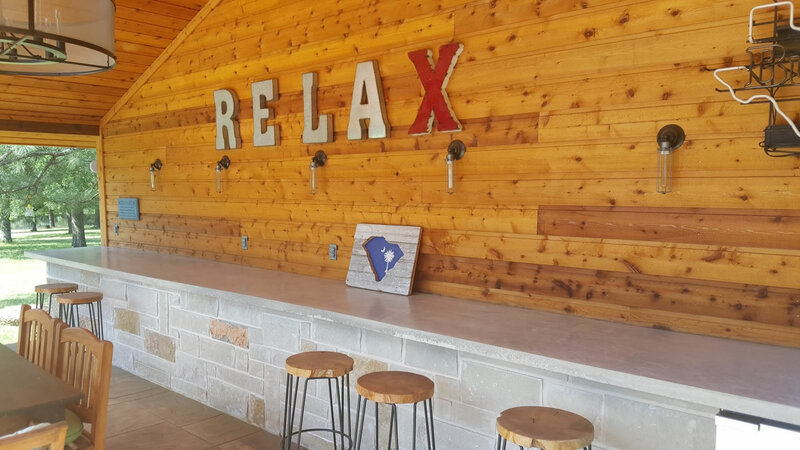 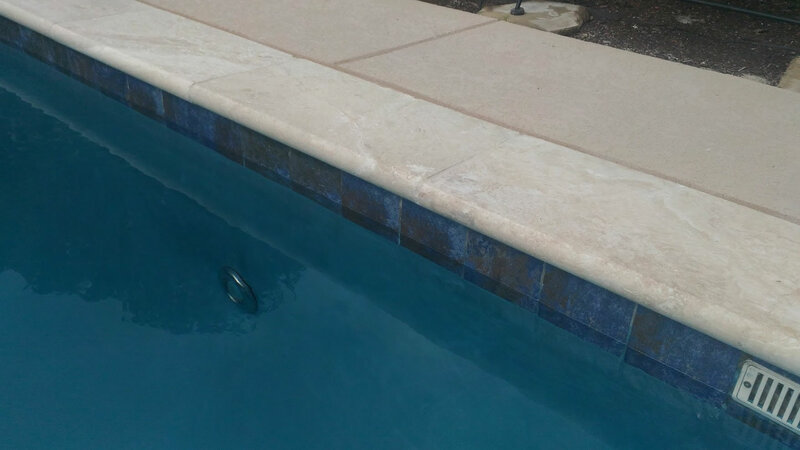 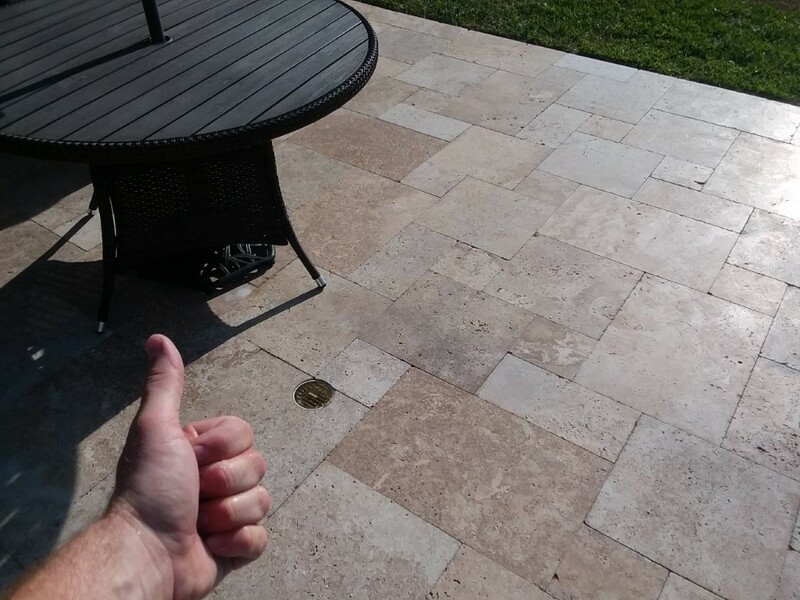 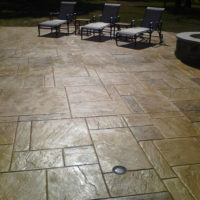 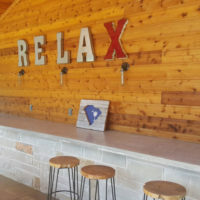 We also installed travertine ledgestone veneer in place of the brick and resurfaced the deck, replaced the tile and replastered the surface with pebble. 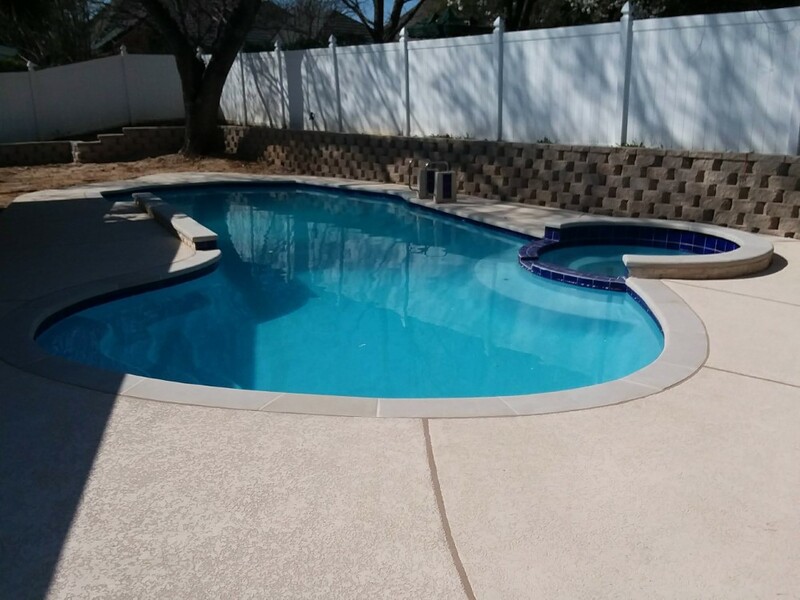 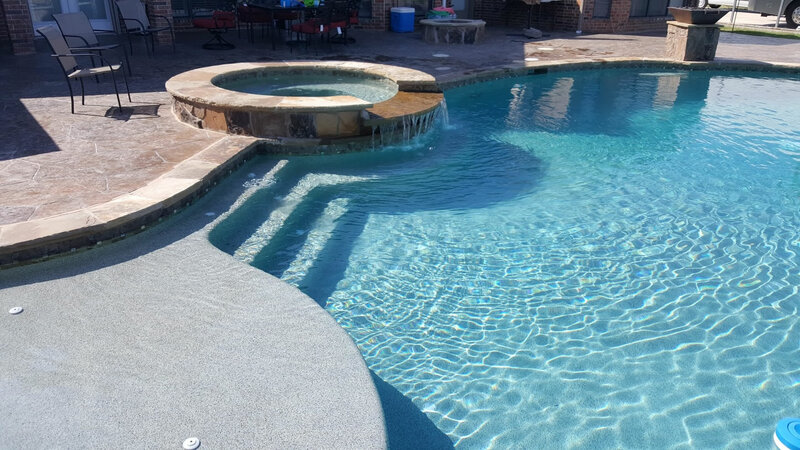 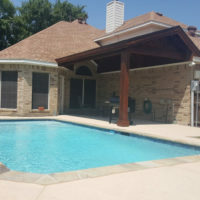 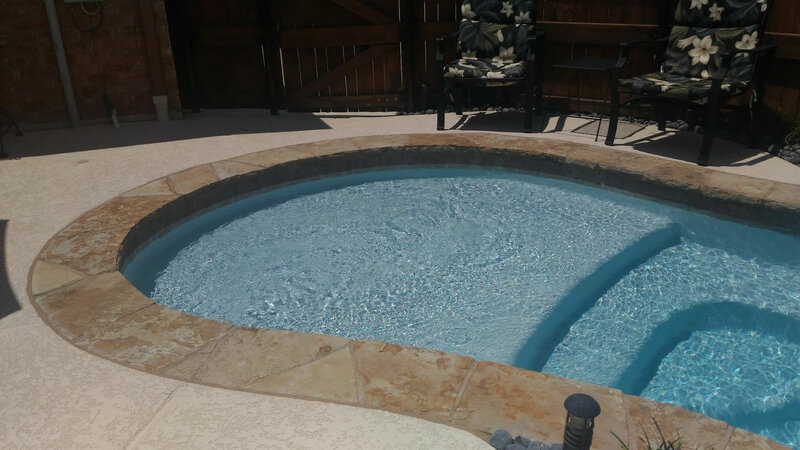 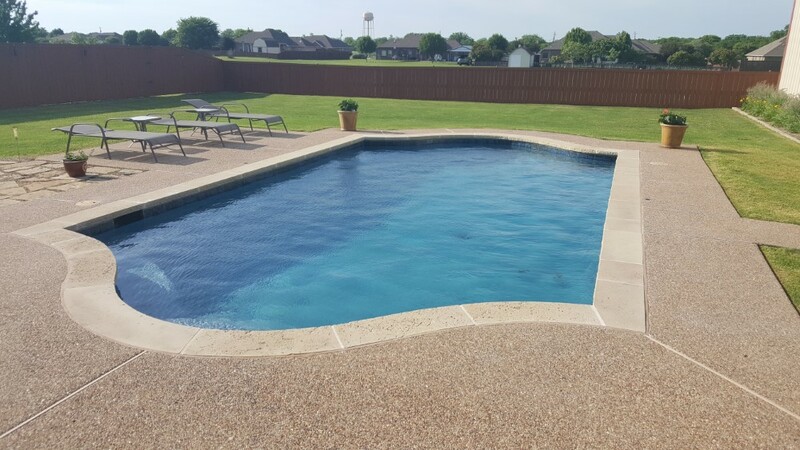 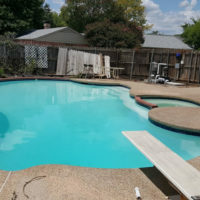 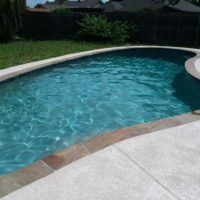 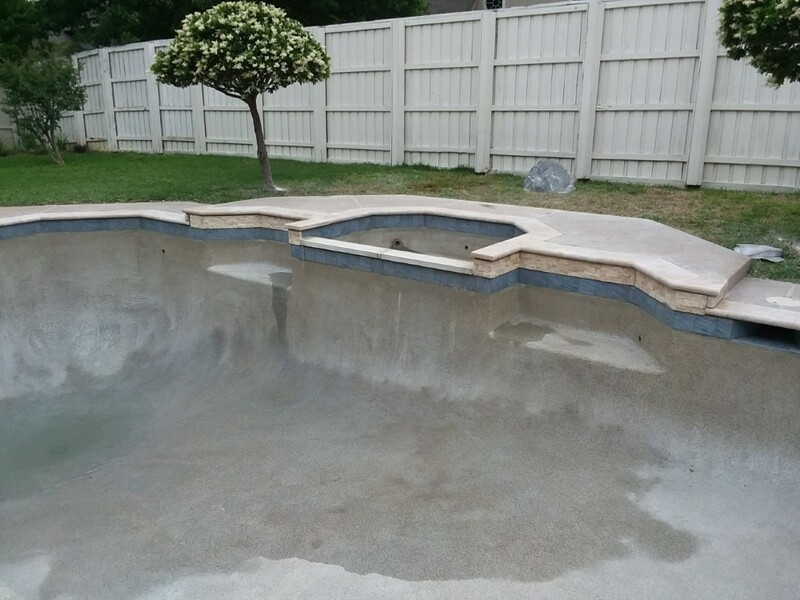 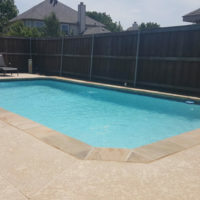 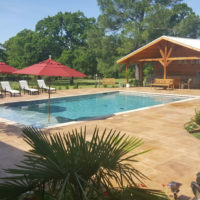 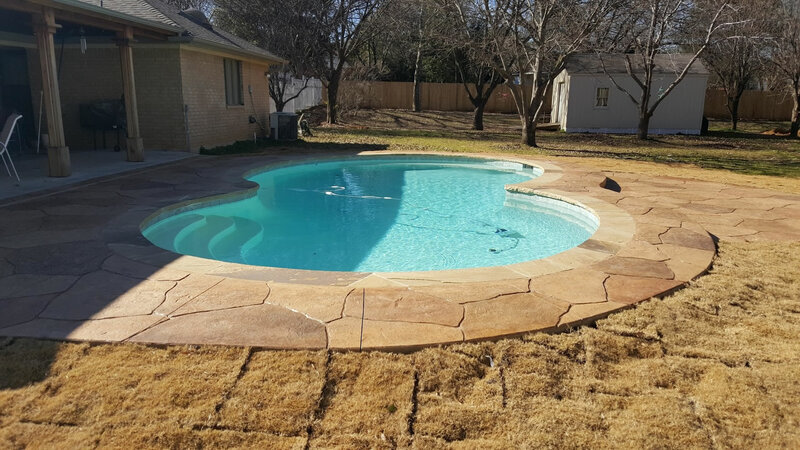 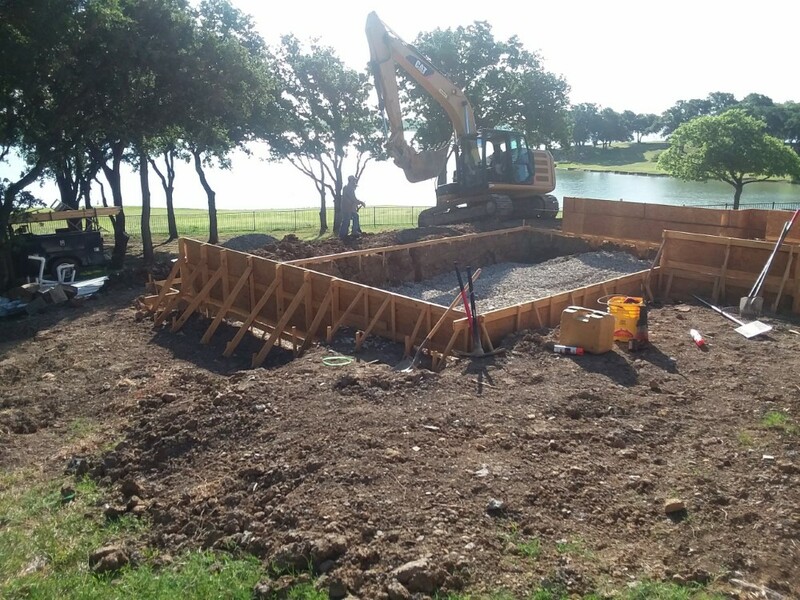 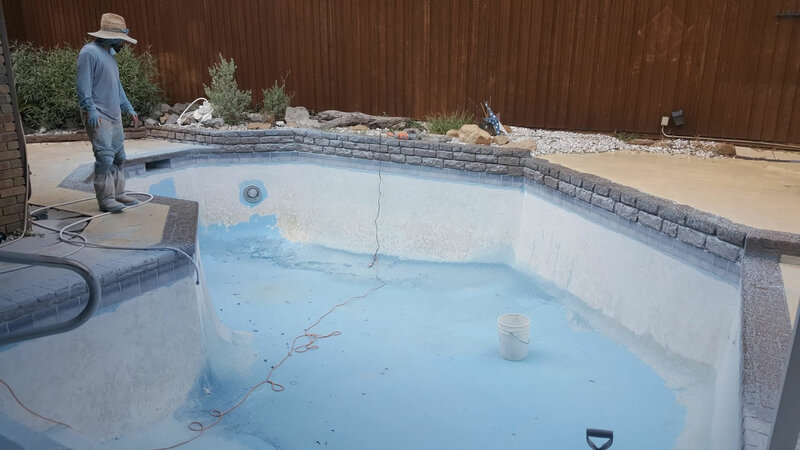 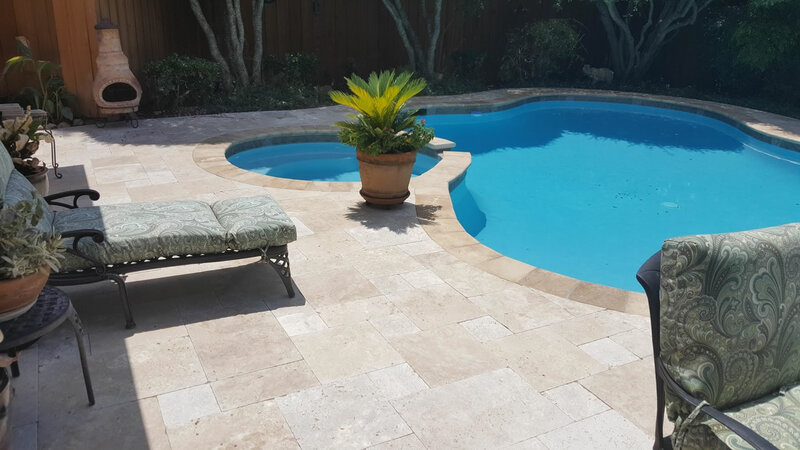 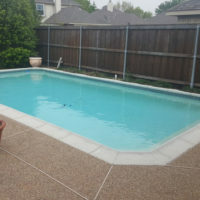 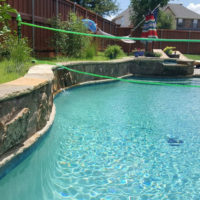 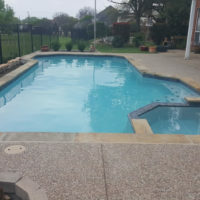 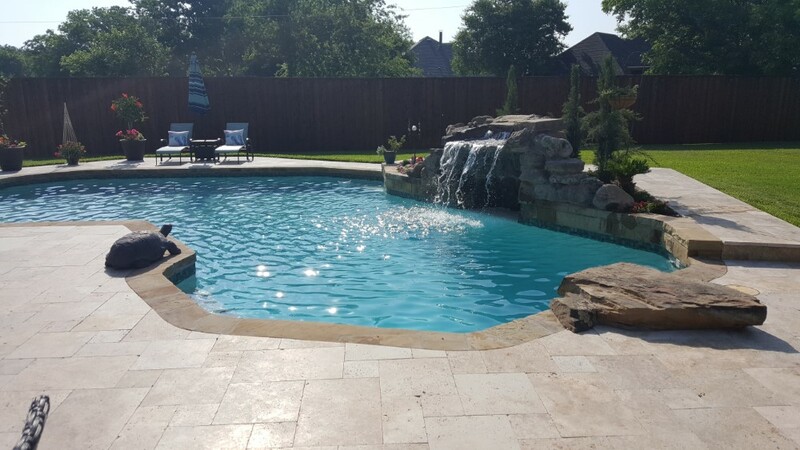 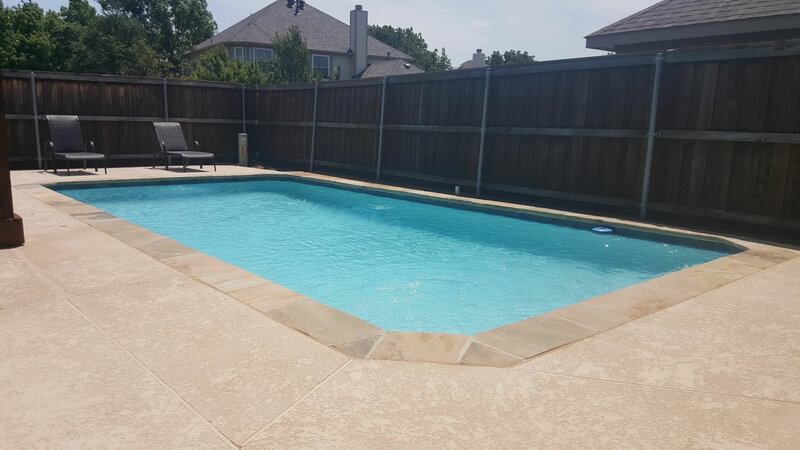 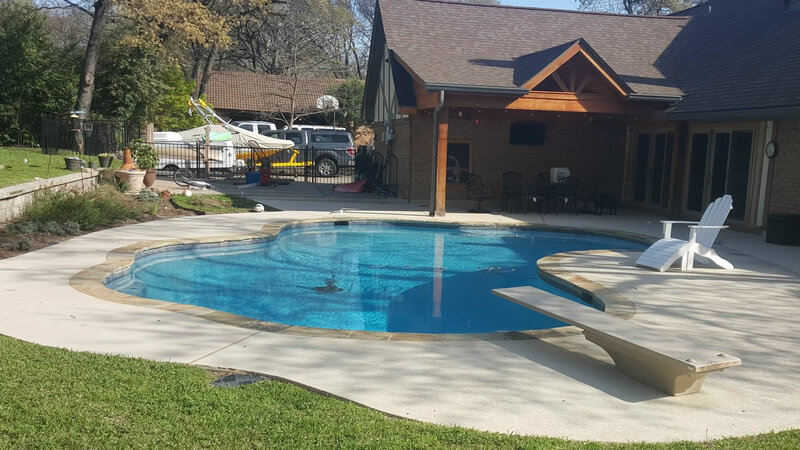 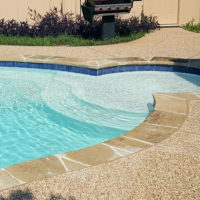 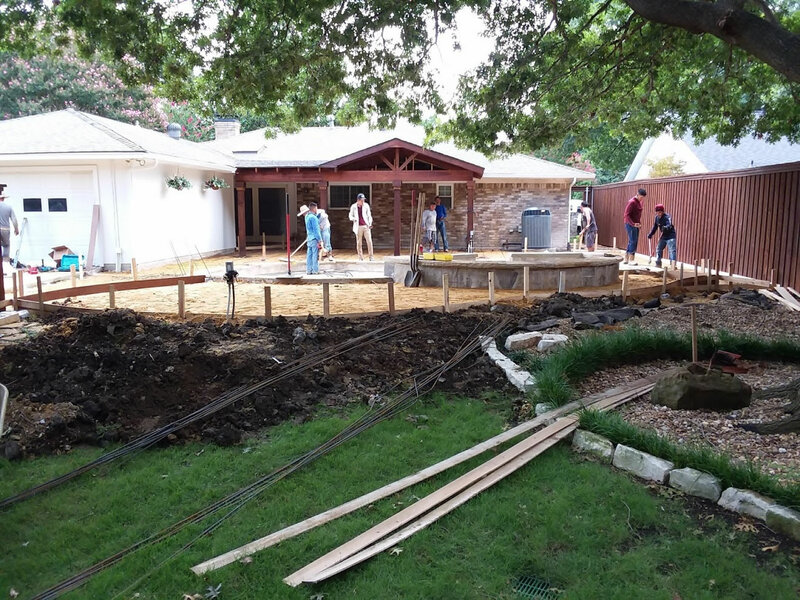 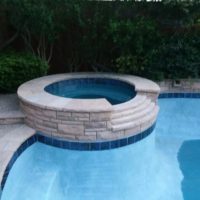 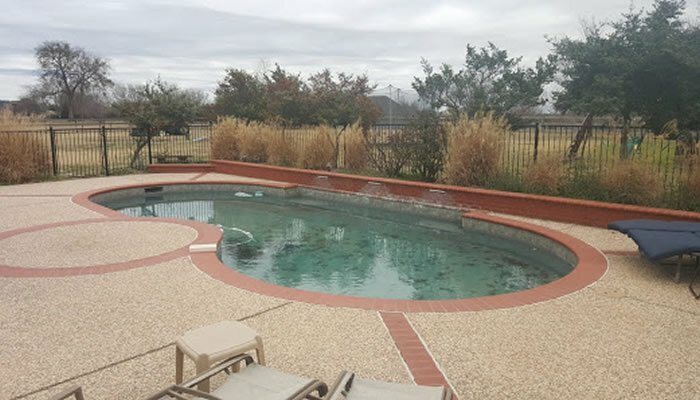 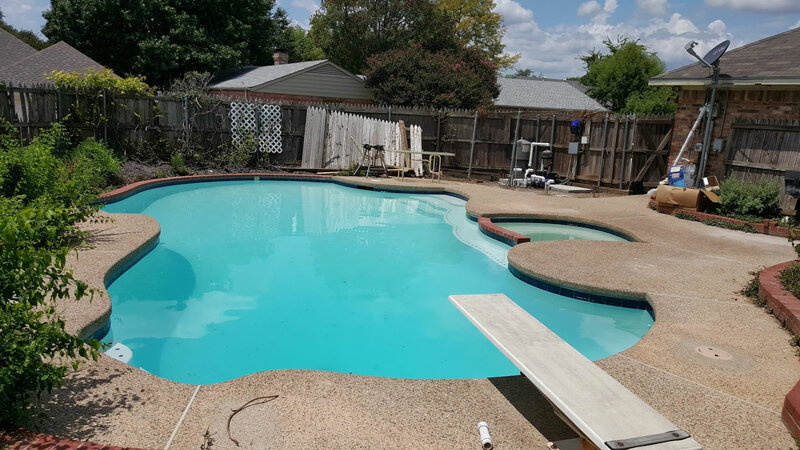 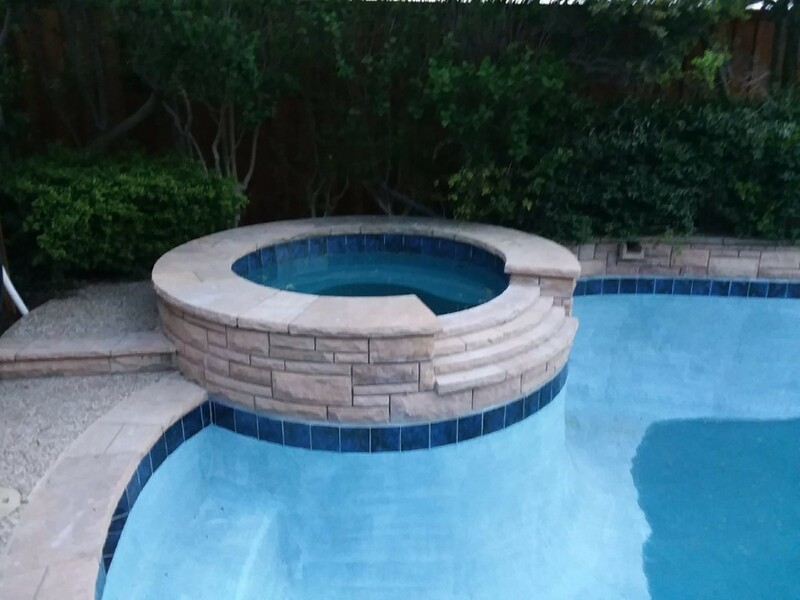 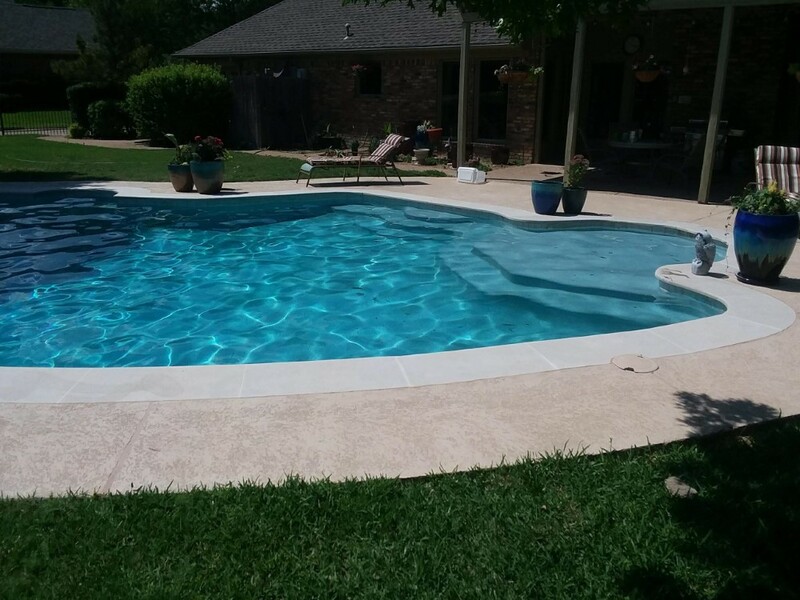 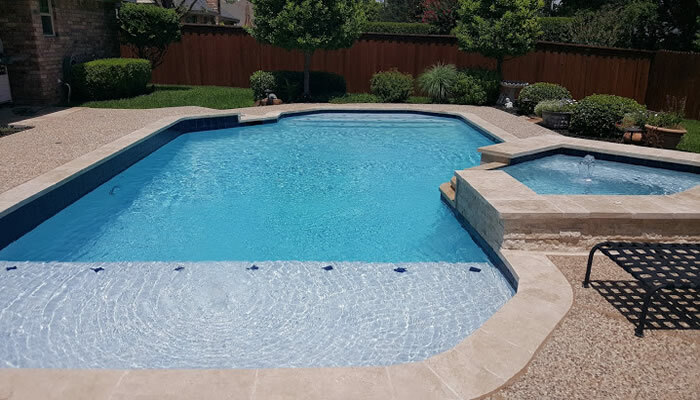 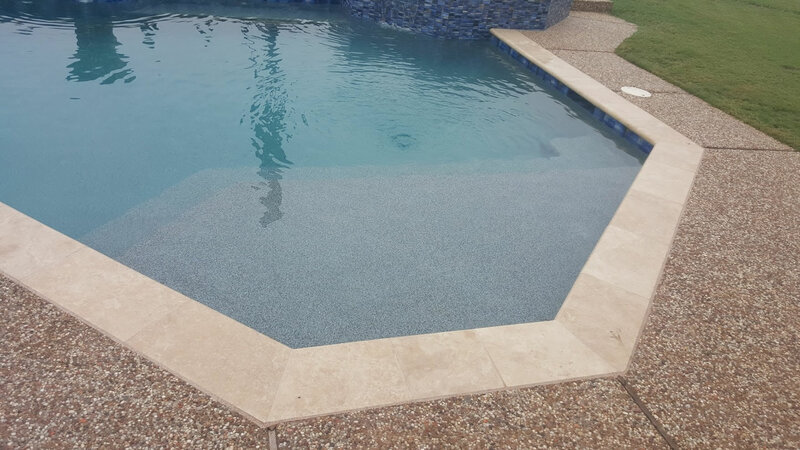 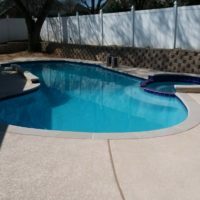 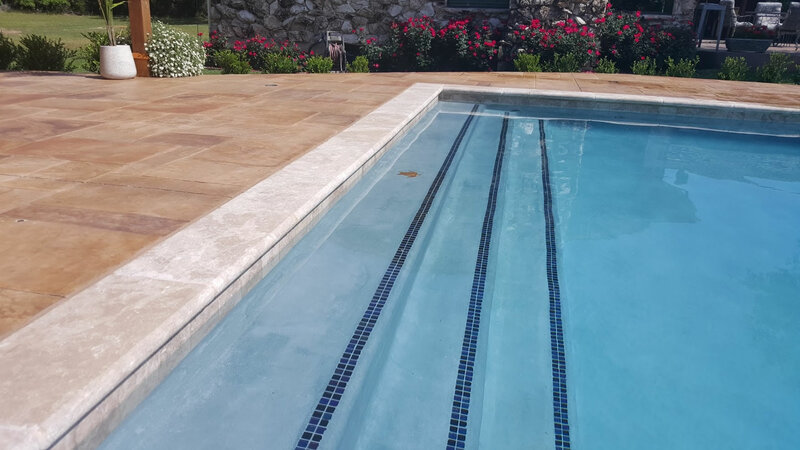 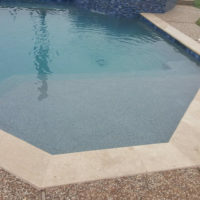 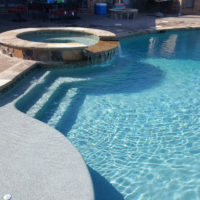 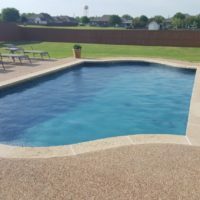 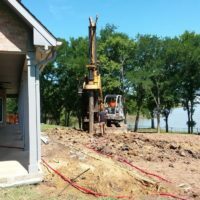 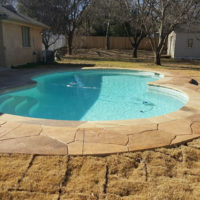 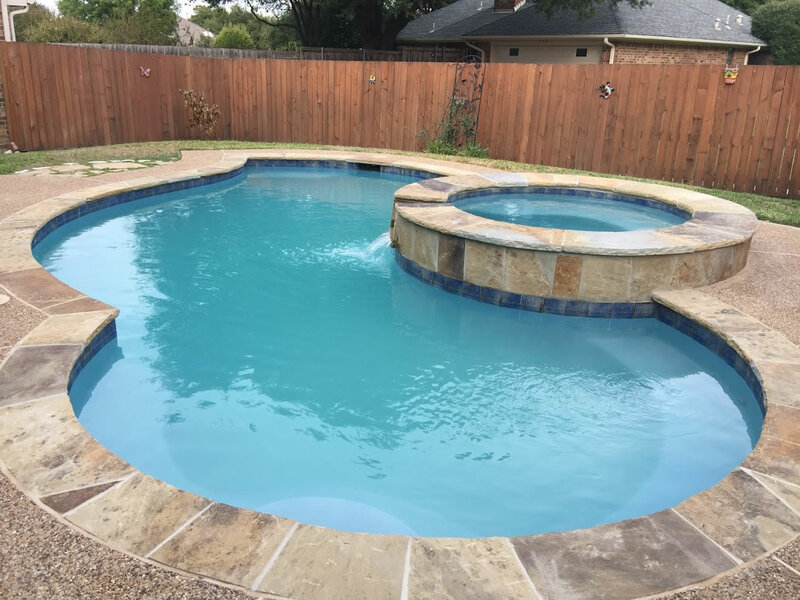 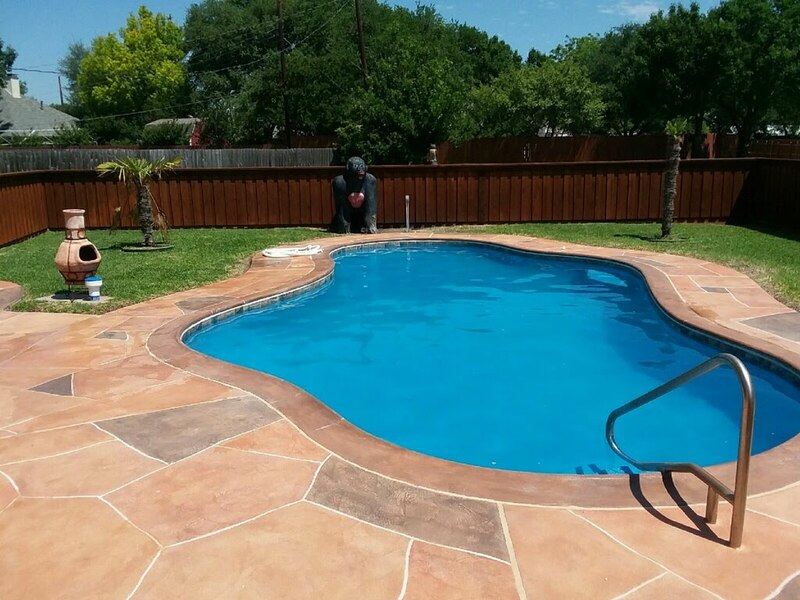 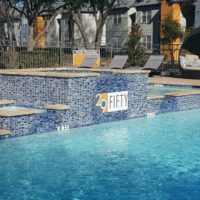 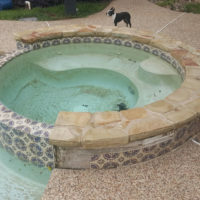 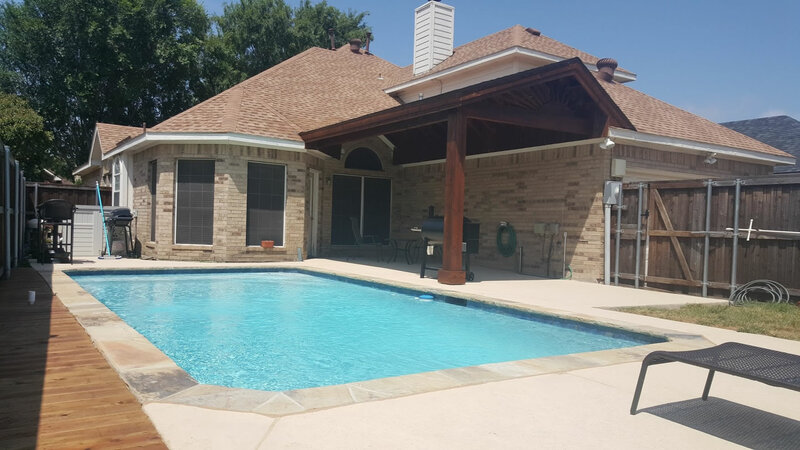 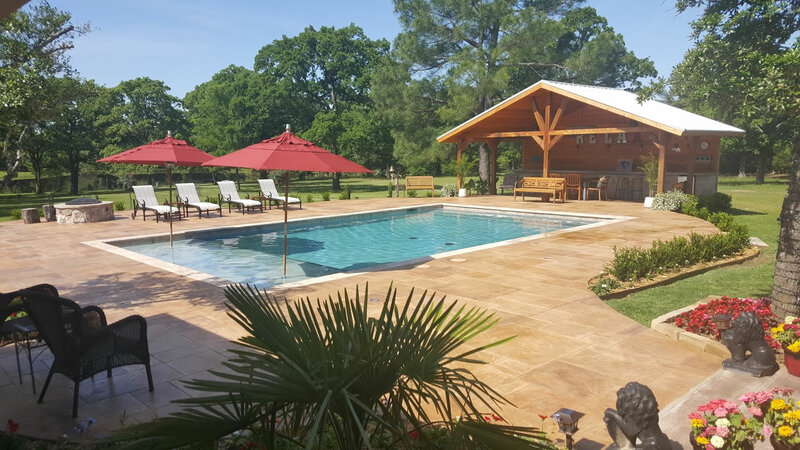 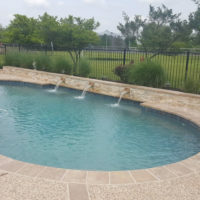 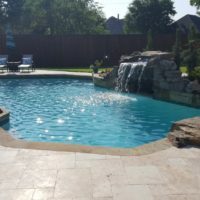 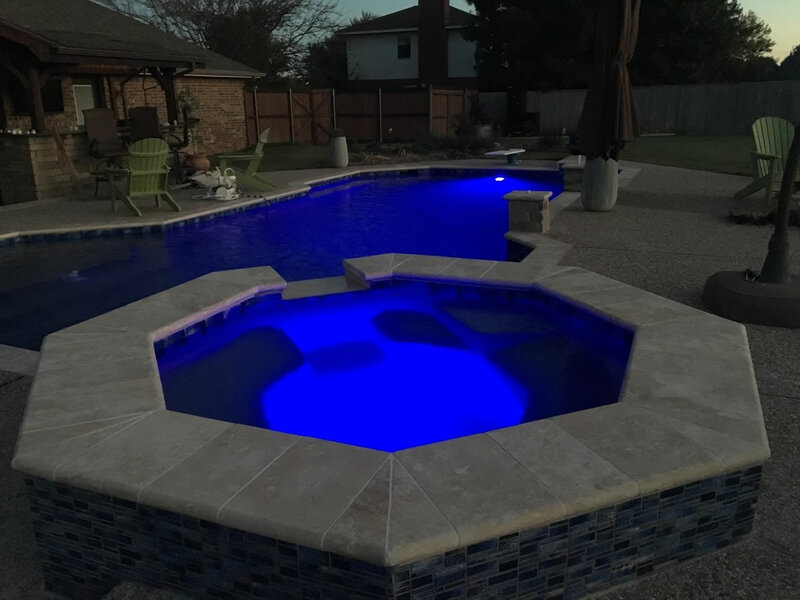 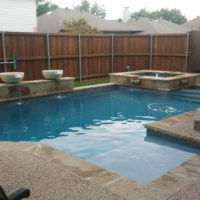 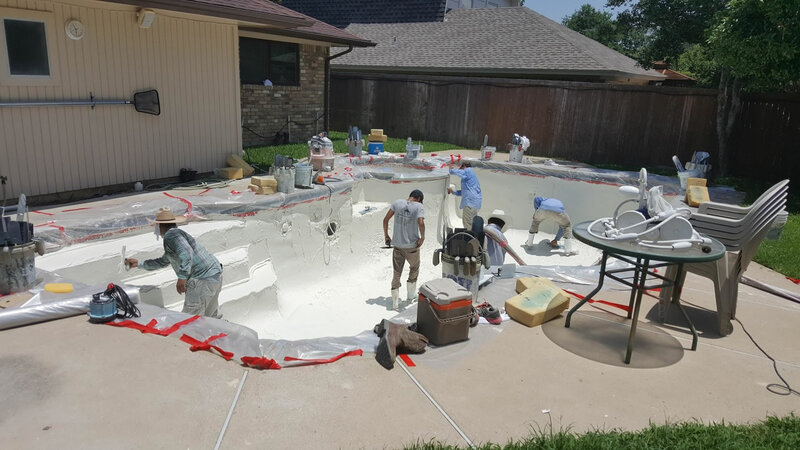 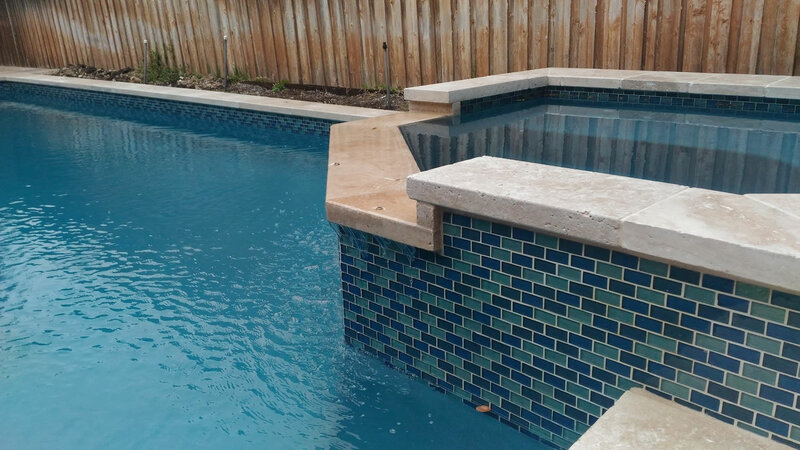 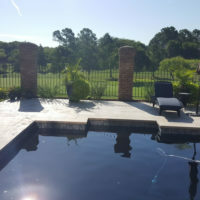 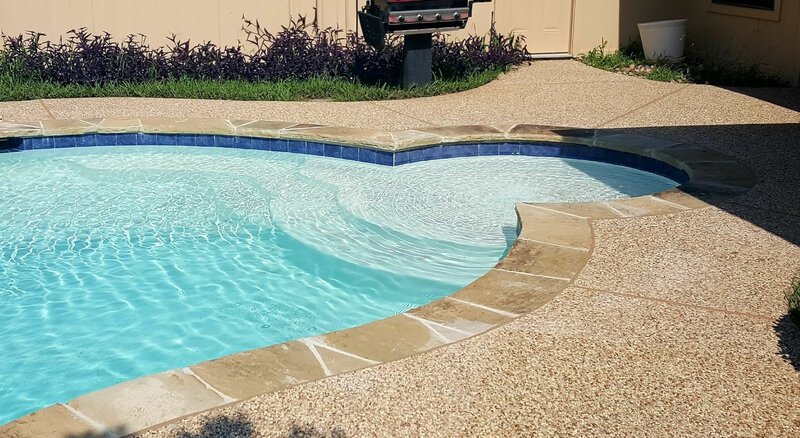 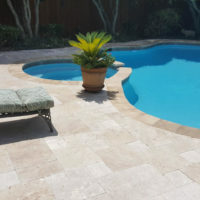 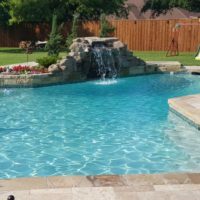 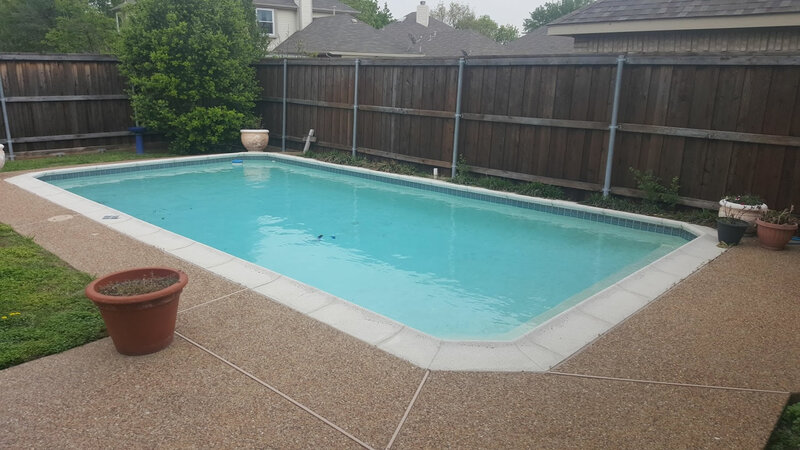 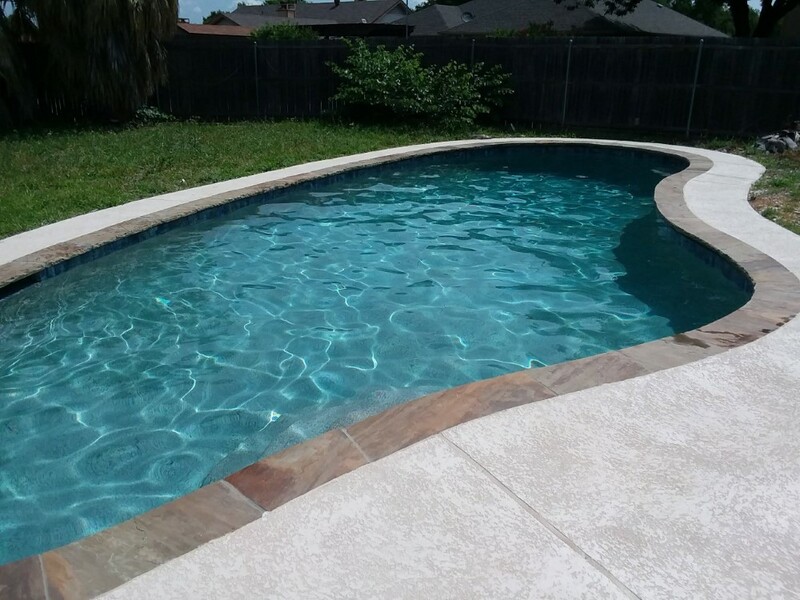 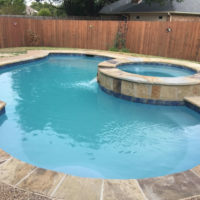 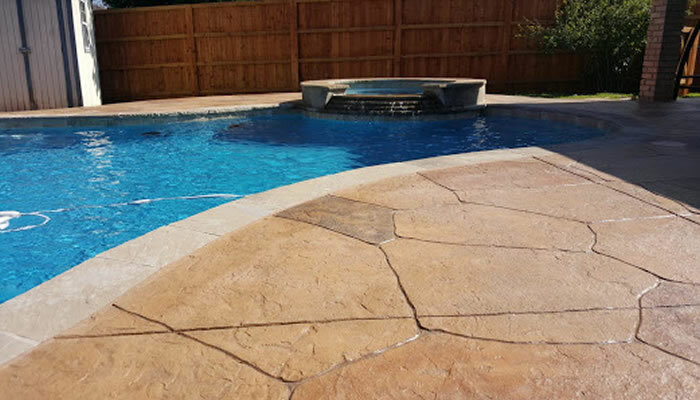 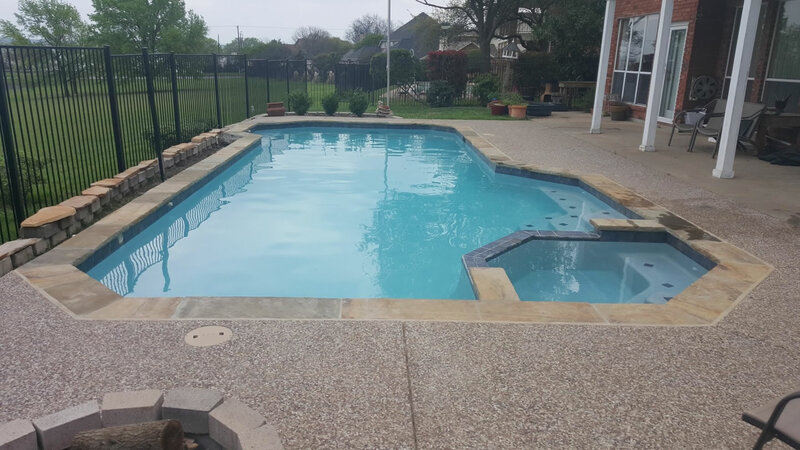 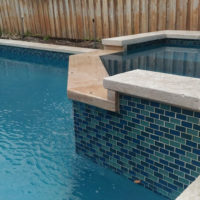 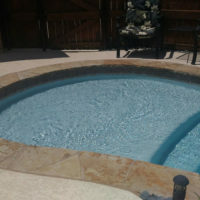 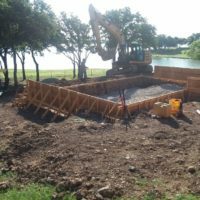 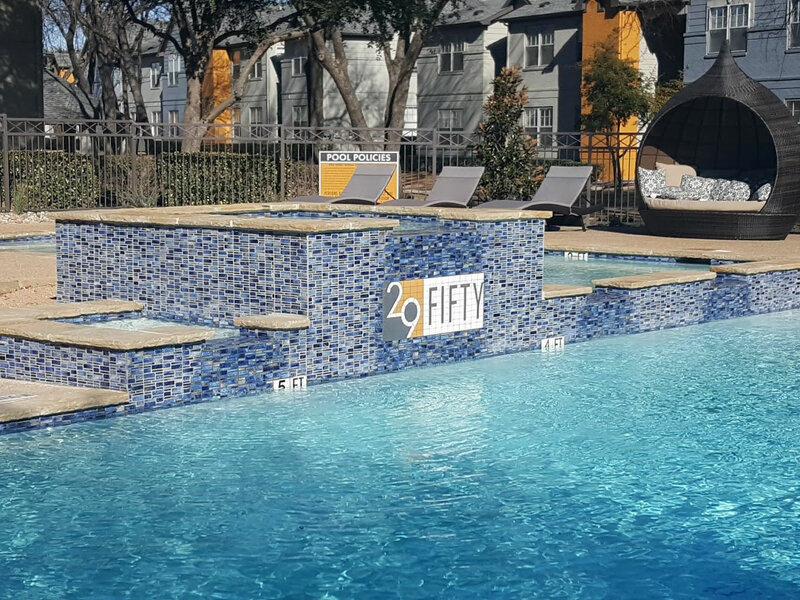 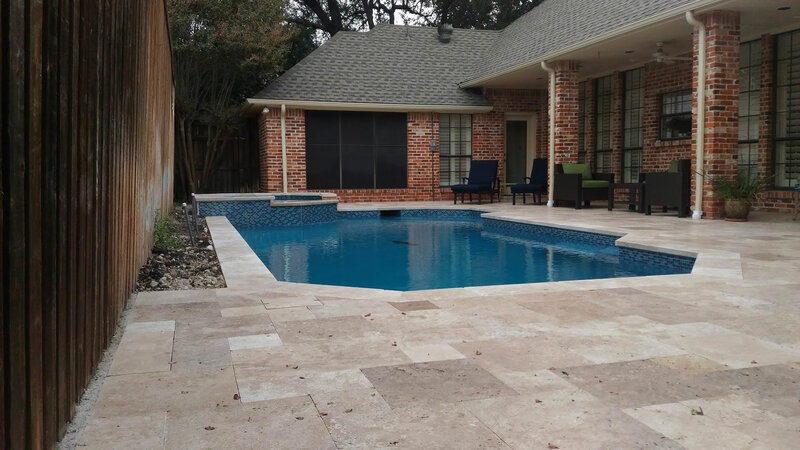 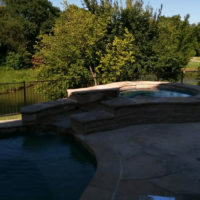 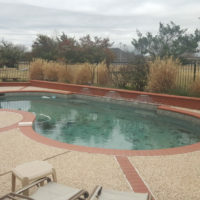 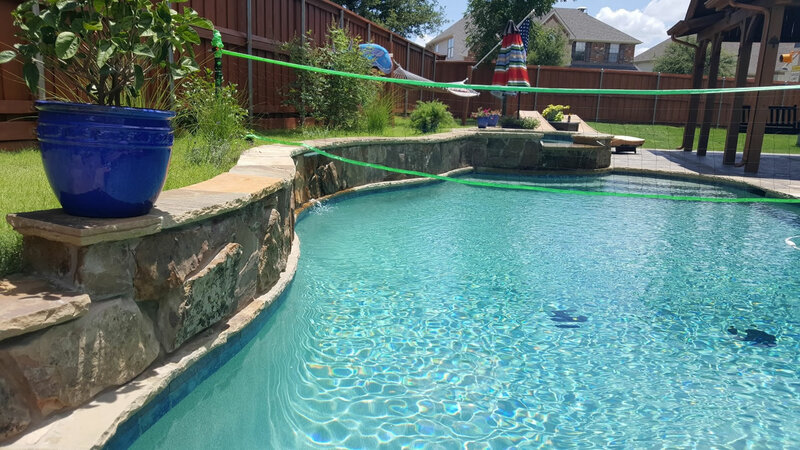 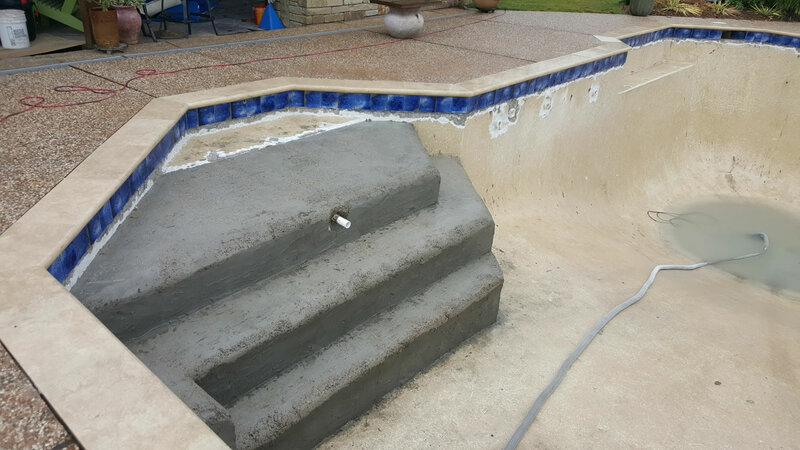 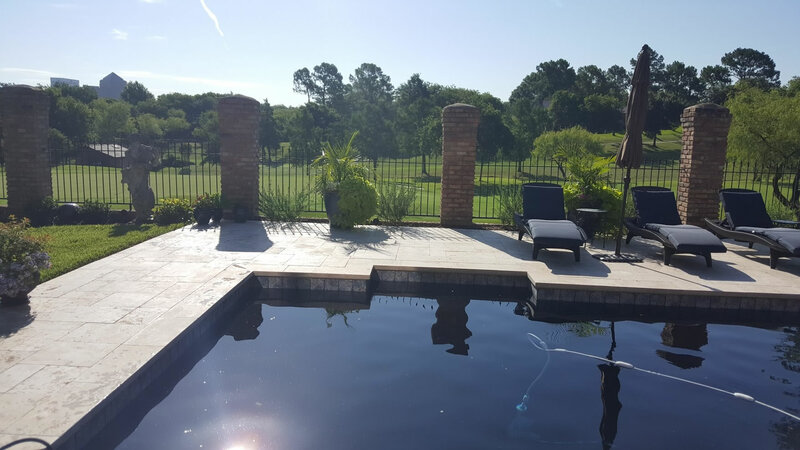 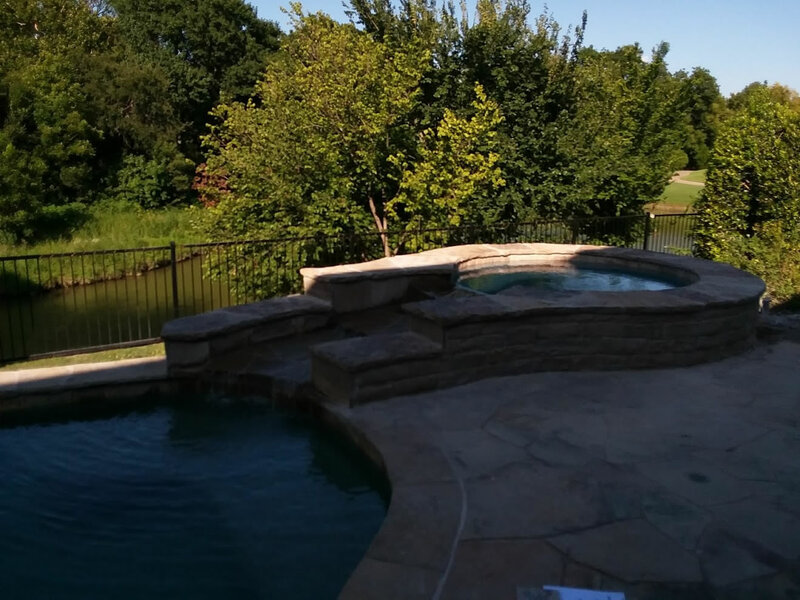 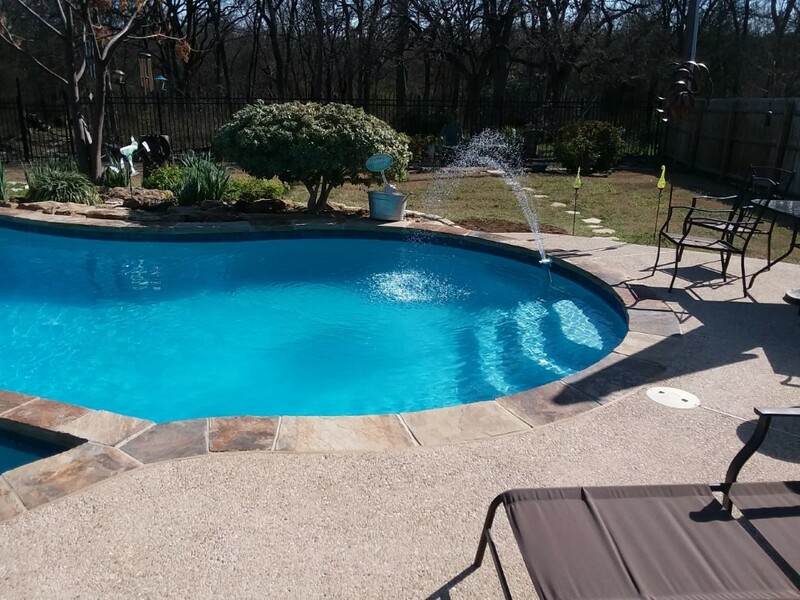 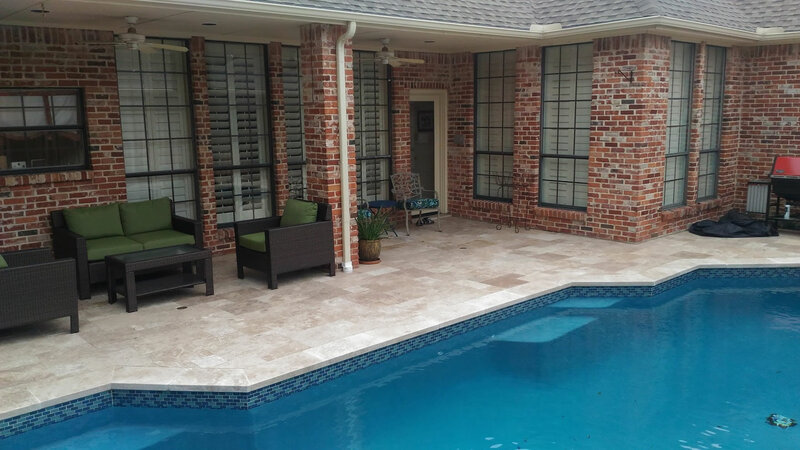 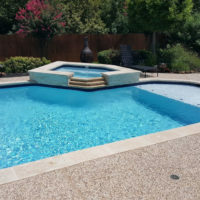 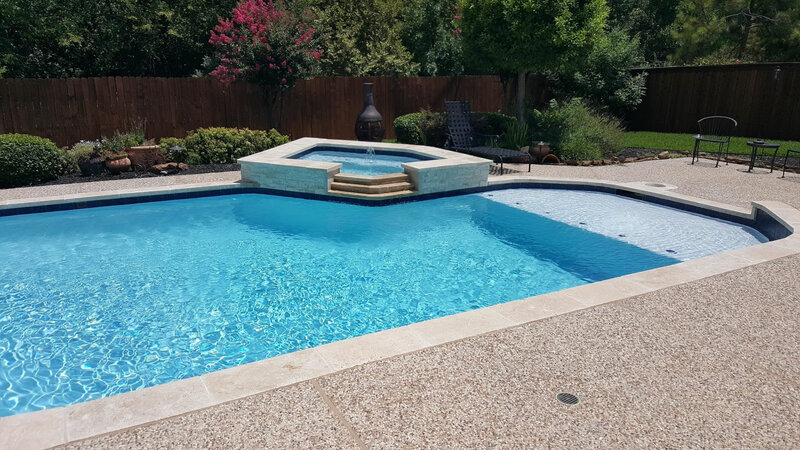 In this new pool project in Cedar Hill we installed Oklahoma flagstone coping, new tile, Quartz plaster and fieldstone pattern stamped concrete. 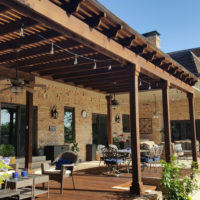 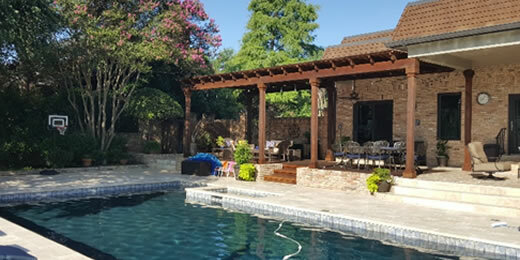 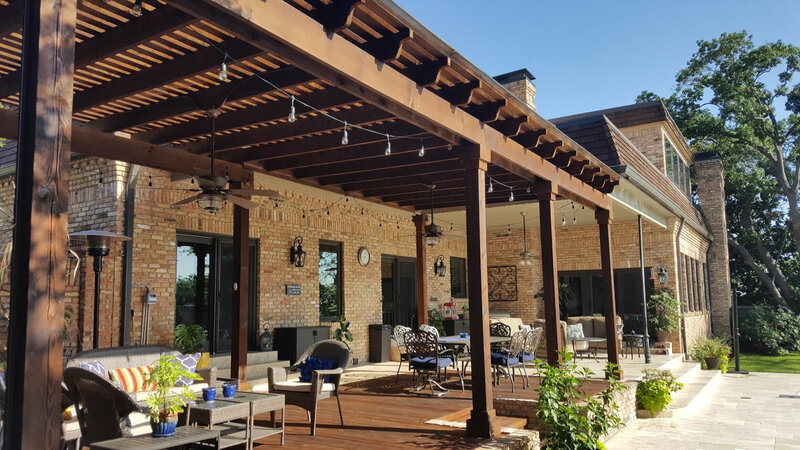 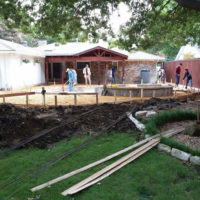 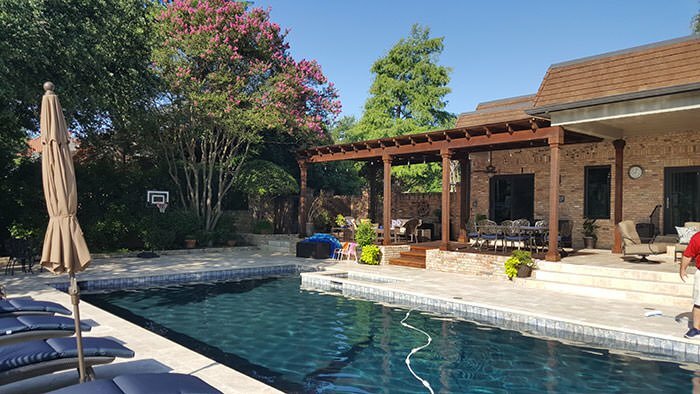 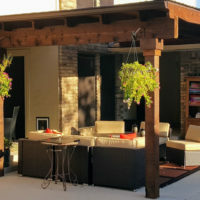 In this complete outdoor remodel in Las Colinas/Irving we built an outdoor structure with cedar deck, installed travertine pavers and coping, along with new tile and quartz plaster. 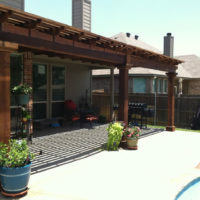 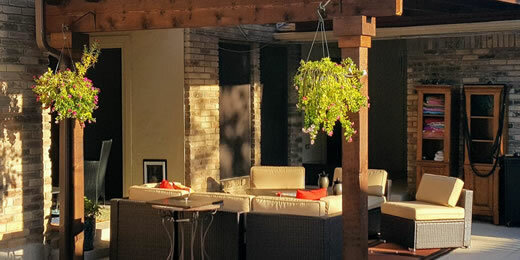 See more photos of these projects at our website. 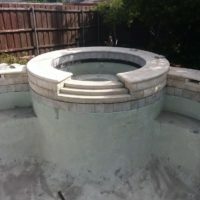 How about removing an unwanted spa, or building a tanning ledge? 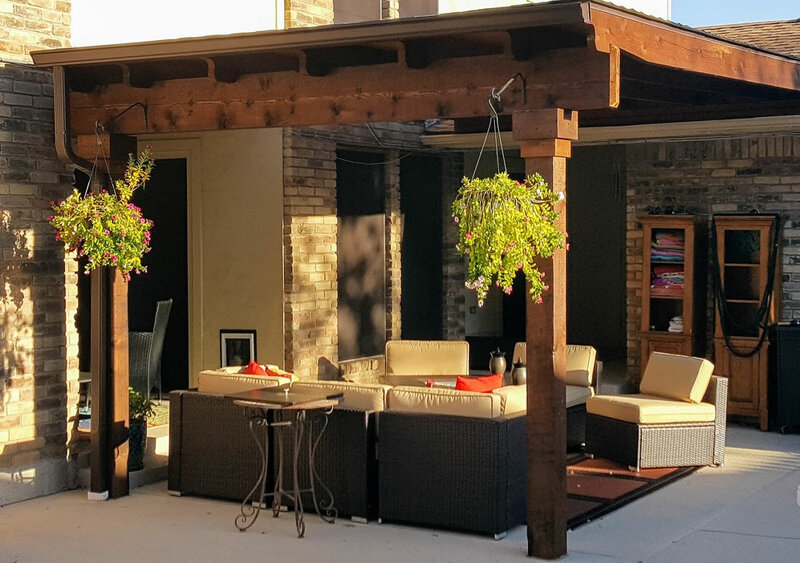 The perfect outdoor party area. 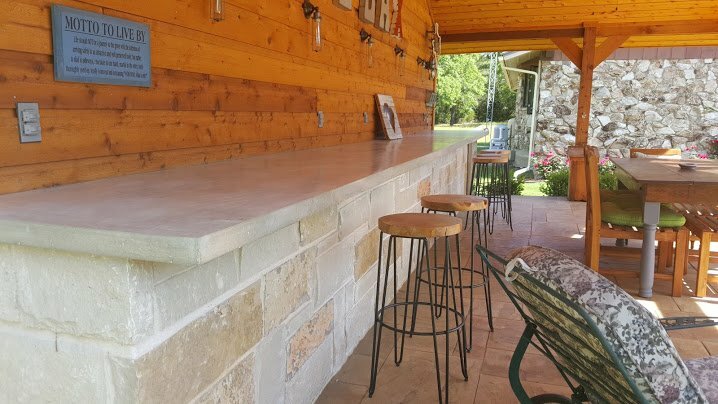 Counter is polished concrete. 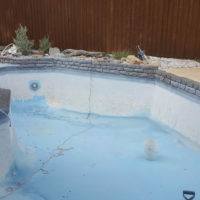 Our 35 year old pool was in really sad shape. 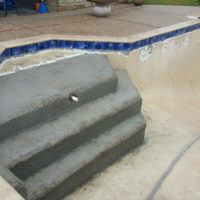 We had not been able to use it for quite a few years and it was a real eye sore. 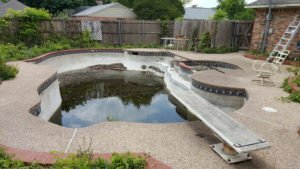 We were actually raising mosquito larva eating guppies in both the main pool and spa to meet the city’s requirements for mosquito control. 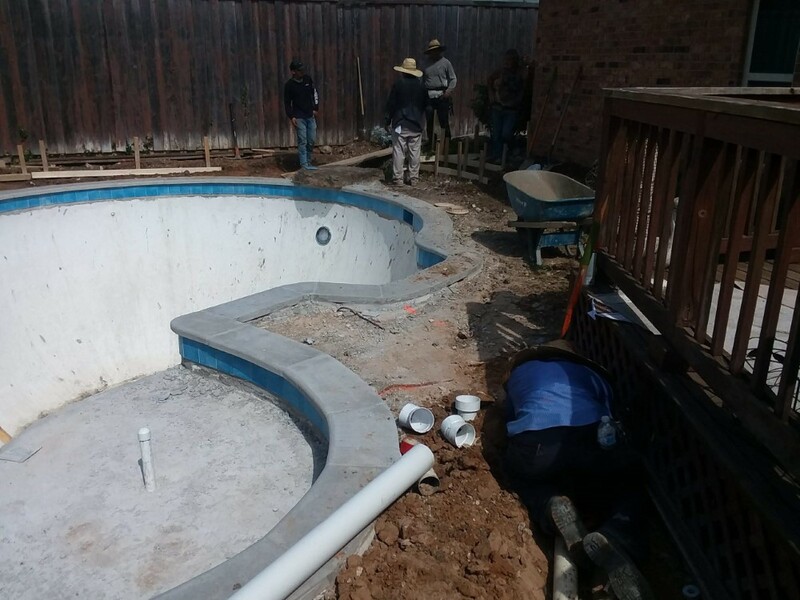 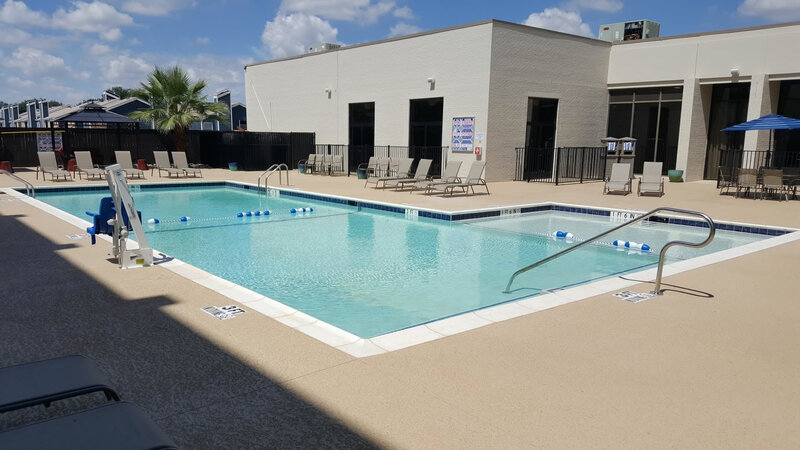 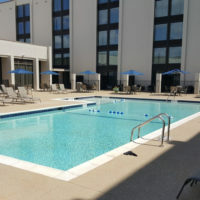 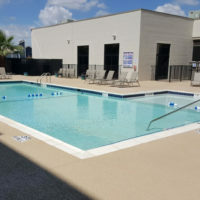 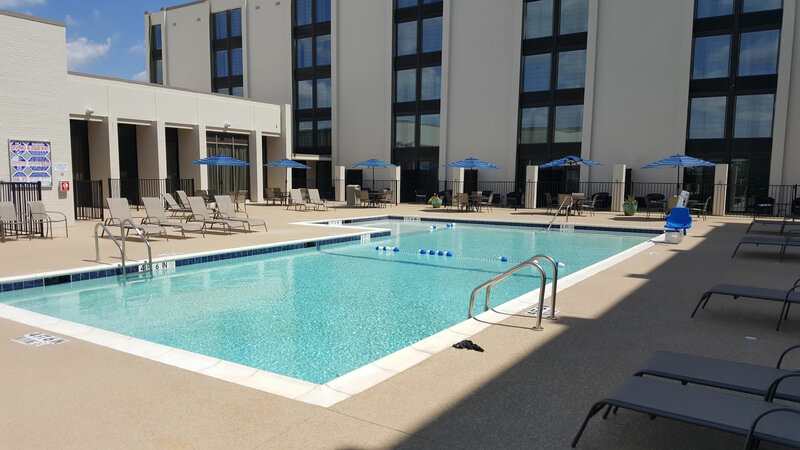 We invited Integrity Pools out for an estimate of the repairs and upgrades. 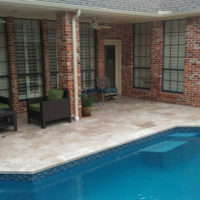 Their sales representative, David Presendofer, made an assessment and gave us a quote. 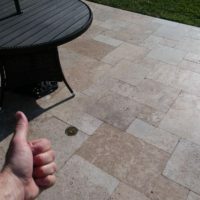 David was polite and seemed quite honest. 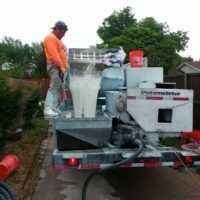 We decided to bite the bullet and clean this mess up. 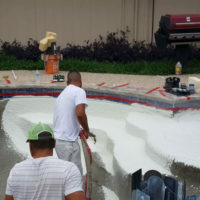 They had a crew out quickly to clean out the pool and power wash it. 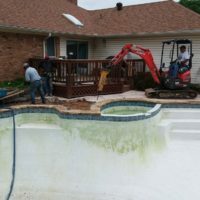 They then leak tested the plumbing and found that every pipe was leaking except for the spa drain. 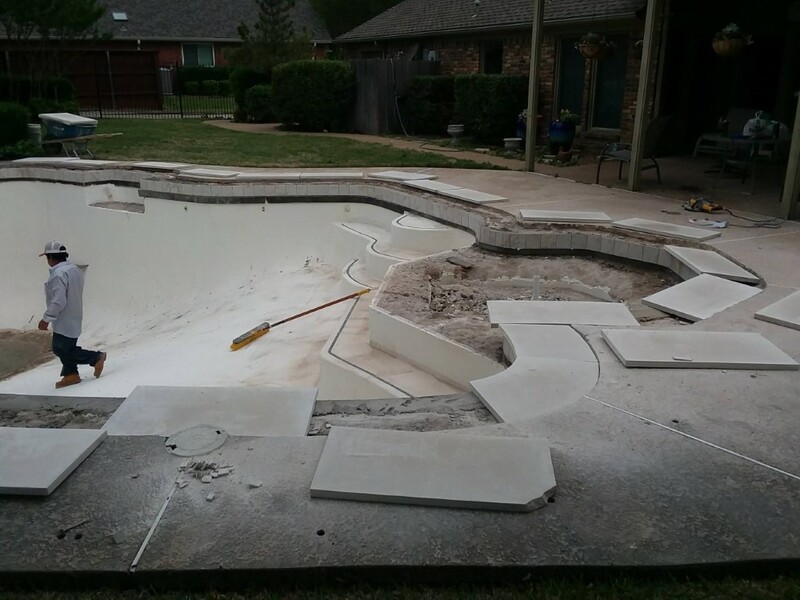 We had a serious discussion about just filling the pool in, but decided to continue on with the journey. 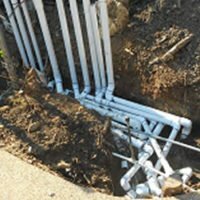 After the plumbing crew dug out the piping at the old equipment area, it was found that much of the pipe had been broken by a volunteer tree that had grown up and crowded the PVC piping. 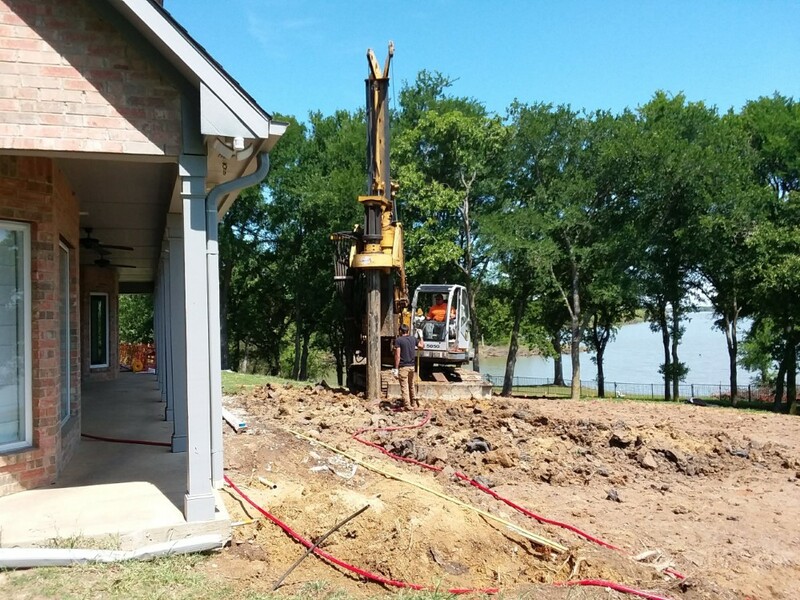 The tree had already been removed, but the stump had to be grounded out. 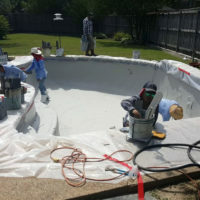 The pool was filled with water and the leak detection crew tested for leaks. 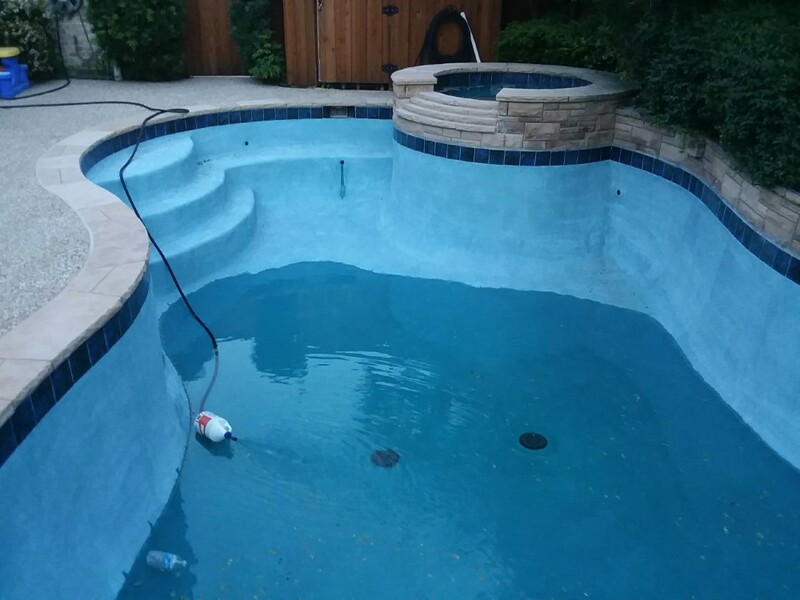 They found cracks which were leaking. 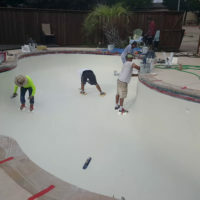 So the pool was drained of the ~21K gals of water and the cracks were patched. 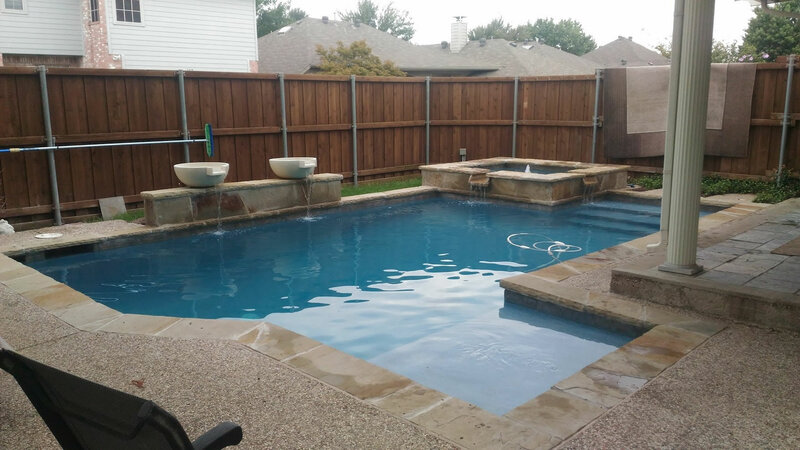 Integrity Pools installed a EcoStar Hayward variable speed pump, SP3400VSP. 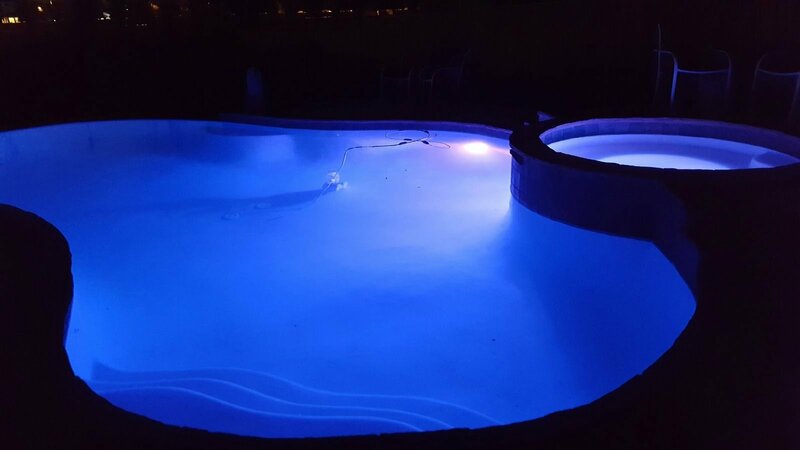 Currently running at ½ speed and only 300W of electricity. 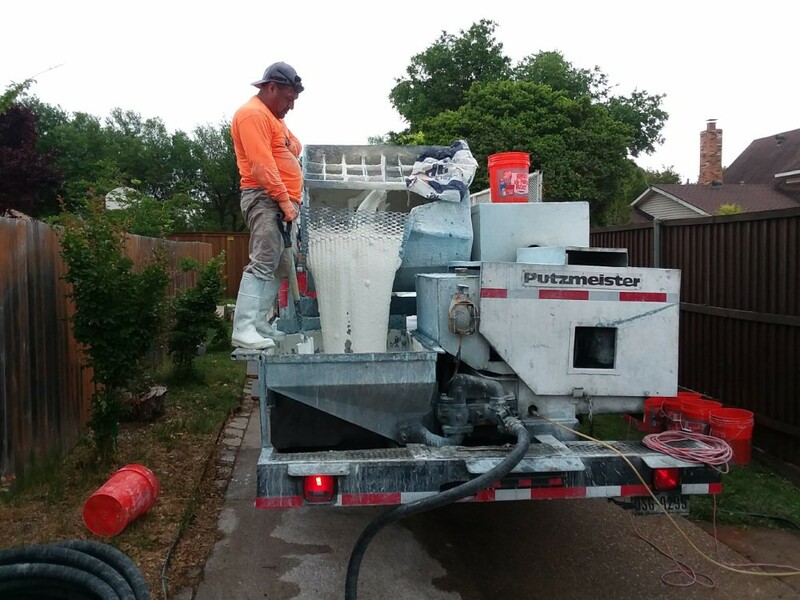 Above the pump is a Waterco multi-cyclone centrifugal pre-filter. 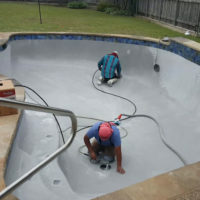 Works similarly to a Dyson vacuum cleaner by centrifugally spinning the water to remove debris. 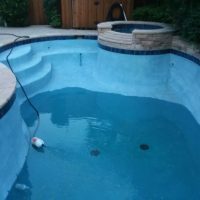 Advertised to remove as much as 80% of trash before the filter. 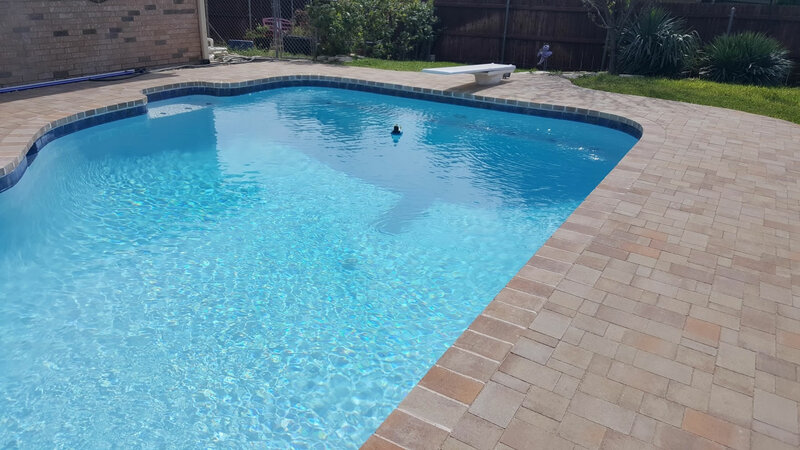 The filter in the back is a Hayward, SwimClear cartridge filter, model C5030 with 525 sq’ of filter surface. 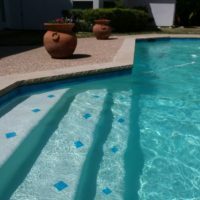 No more DE. 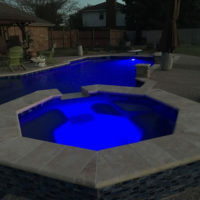 In front, the blue-ended cylinder is a chlorine generator. 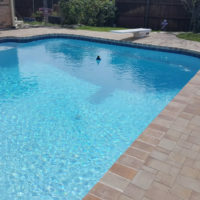 It is a RJ+60 from CircuPool. 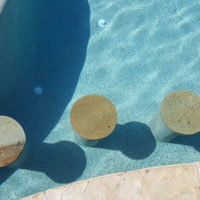 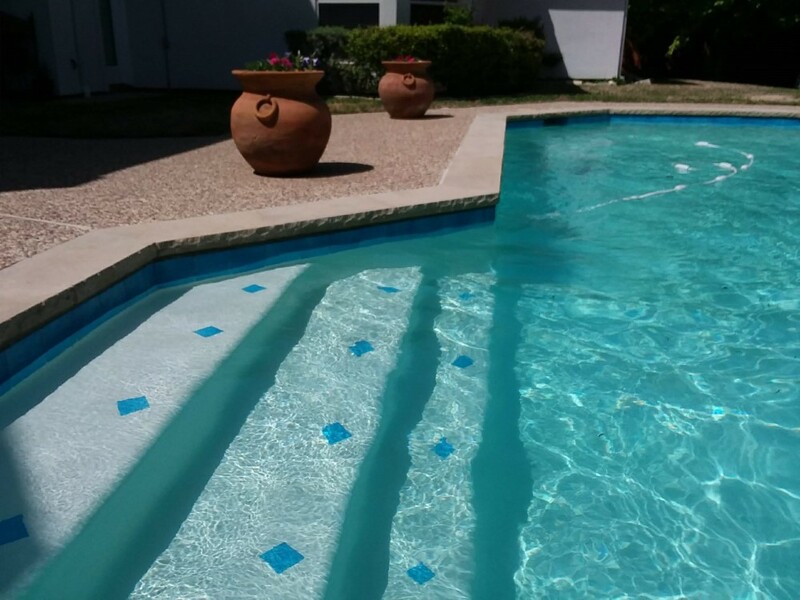 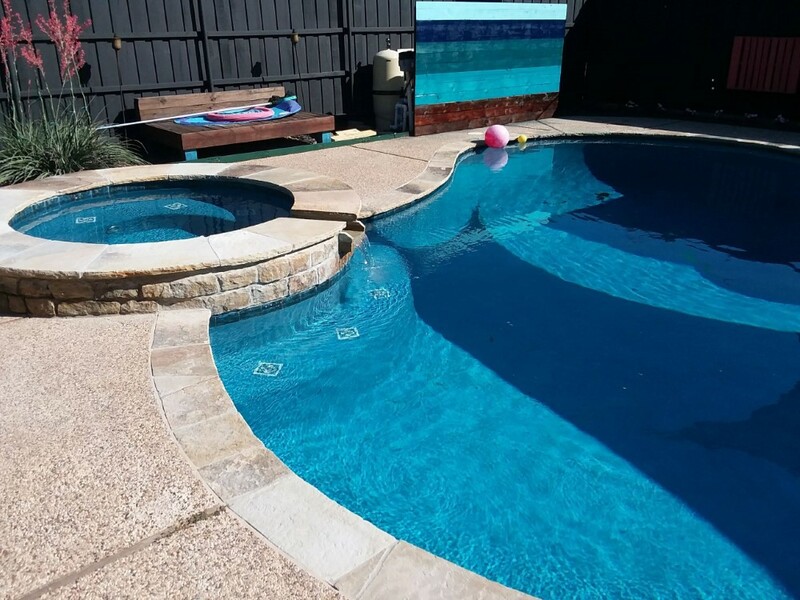 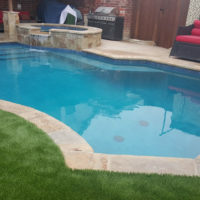 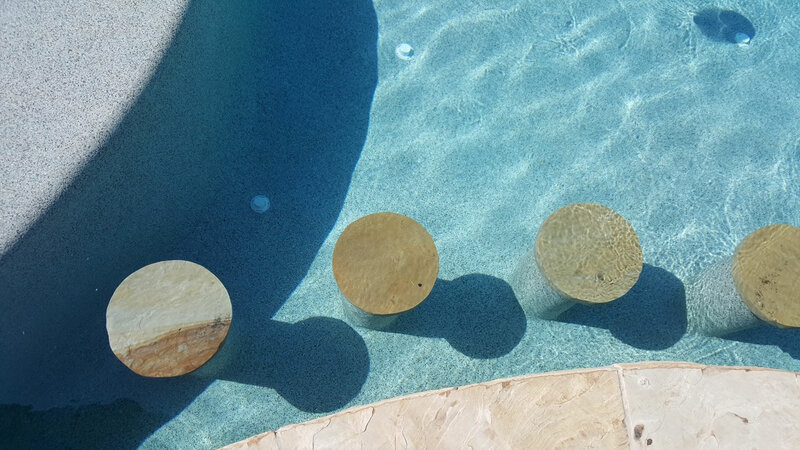 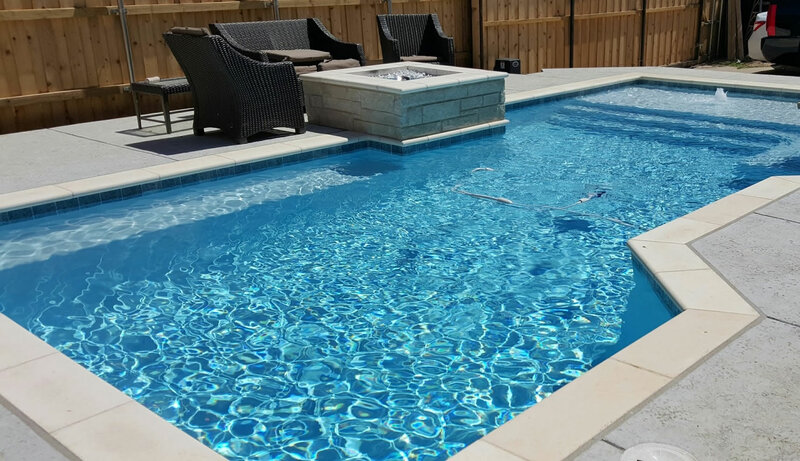 We were very pleased with the job that Integrity Pools did for us. 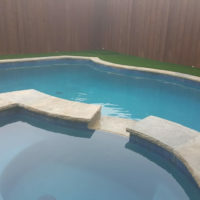 The owner of the company, Matthew Dunshea, was easy to work with, not pushy, and tried to save us money all through the project. 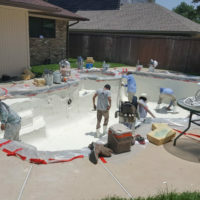 It was a lot of work, but their company was up to the task. 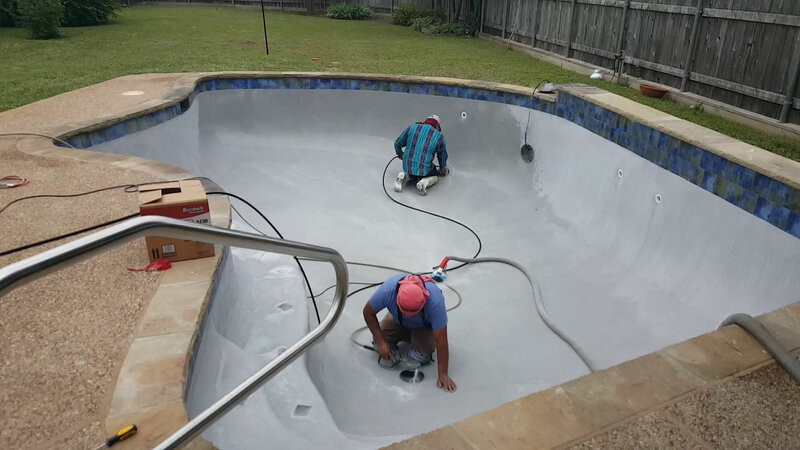 We would recommend them to any of our friends, neighbors, or family.